While I was reading Fanny Burney’s diaries, I came across frequent references to the post of equerry. But what exactly was an equerry? Members of the royal family still have equerries today who help them fulfil their public duties. The role is equivalent to that of an aide-de-camp and an equerry is seconded to the role from the armed forces for a period of three years. 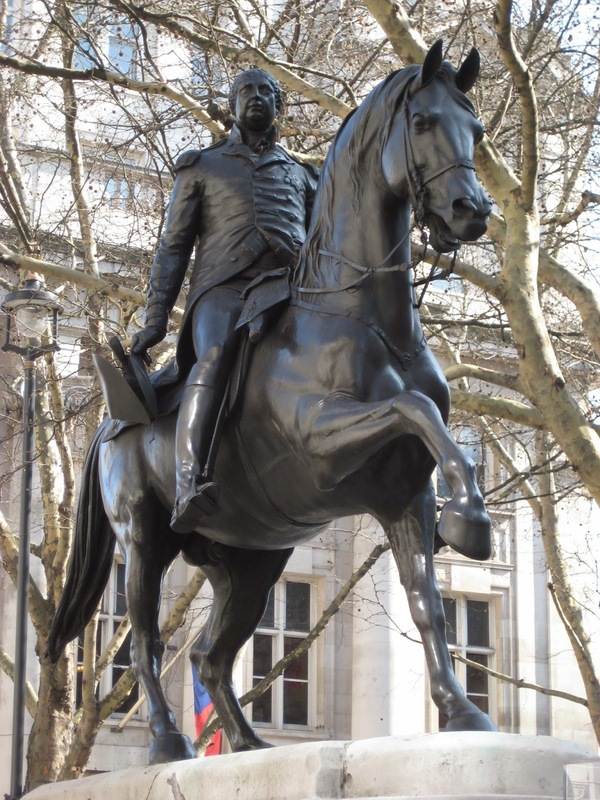 Historically, an equerry was an officer in charge of the stables of a member of the royal family. 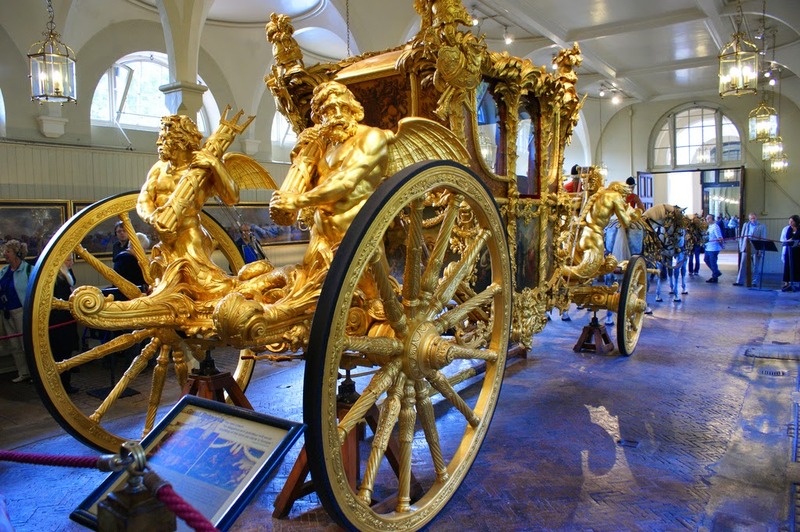 Today, the Crown Equerry is in charge of the Royal Mews, but the Queen’s Equerry personally assists the Queen with her duties. 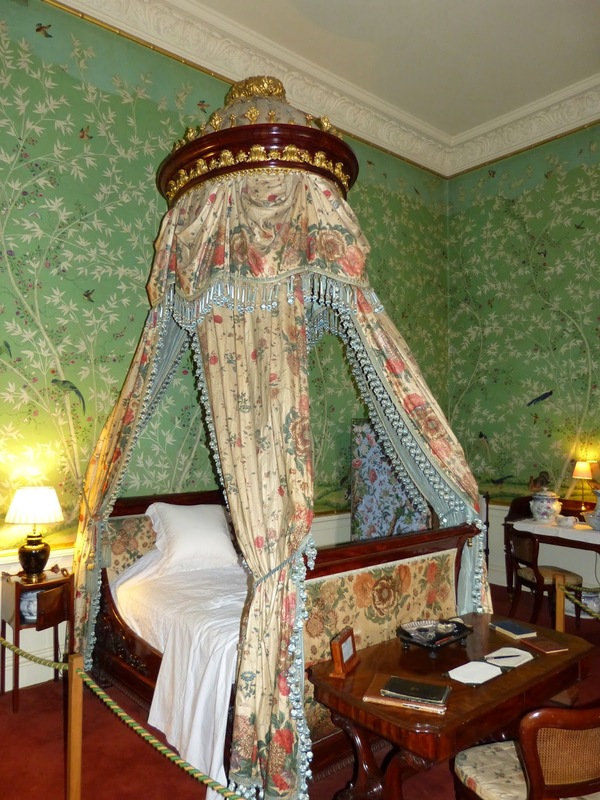 “The Chief Equerry was formerly always styled Gentleman of the Horse, as the first Gentleman of the Bed-chamber was entitled Groom of the Stole. What did an equerry do? 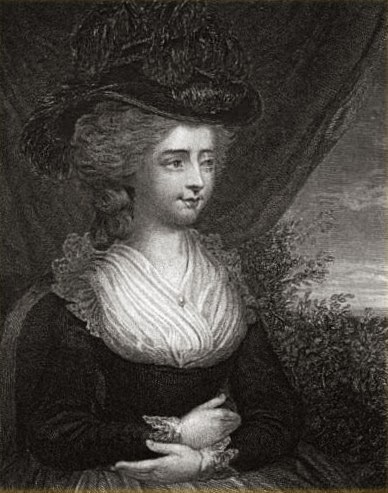 Fanny Burney was second keeper of the robes for Queen Charlotte from 1786 to 1791. 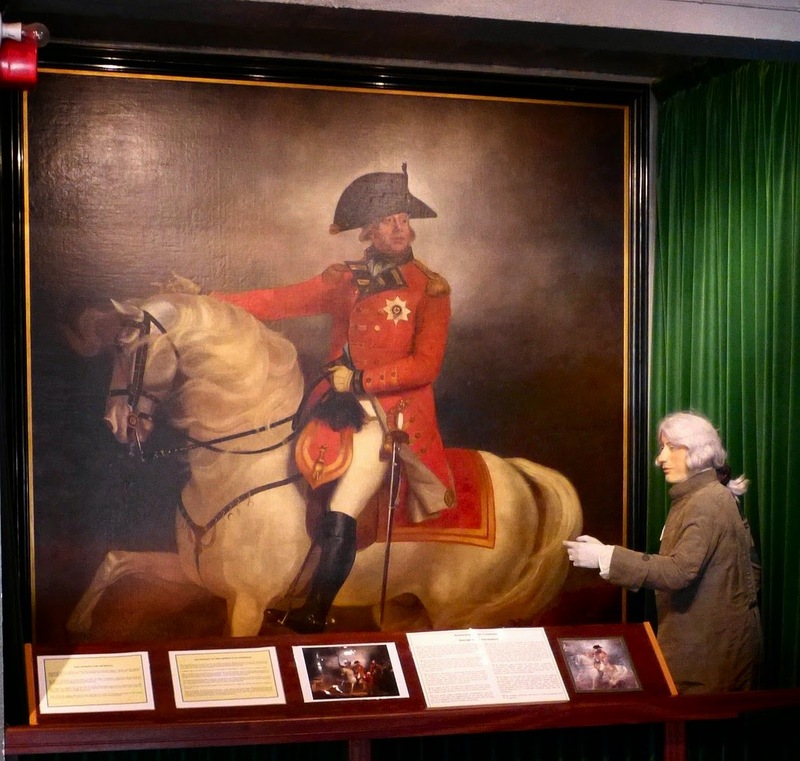 In her diaries, she regularly mentioned George III’s equerries and what they did. Their role entailed personal attendance on the King. It was a tiring and physically demanding role. 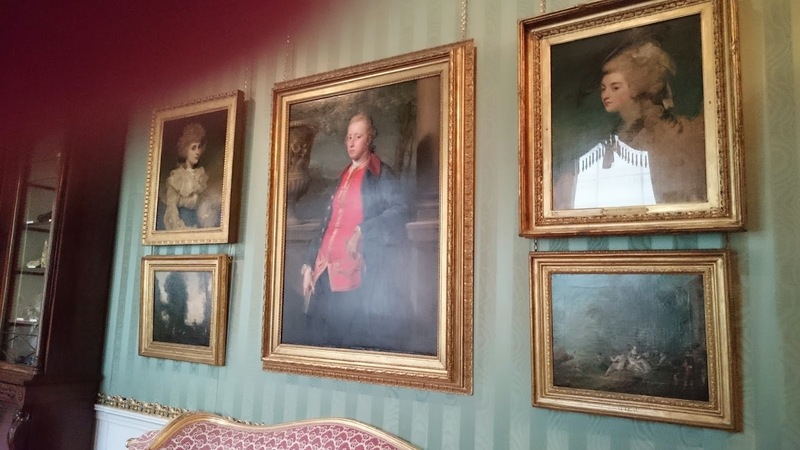 Fanny Burney used the term “equerry in waiting” to refer to the equerry currently in attendance. 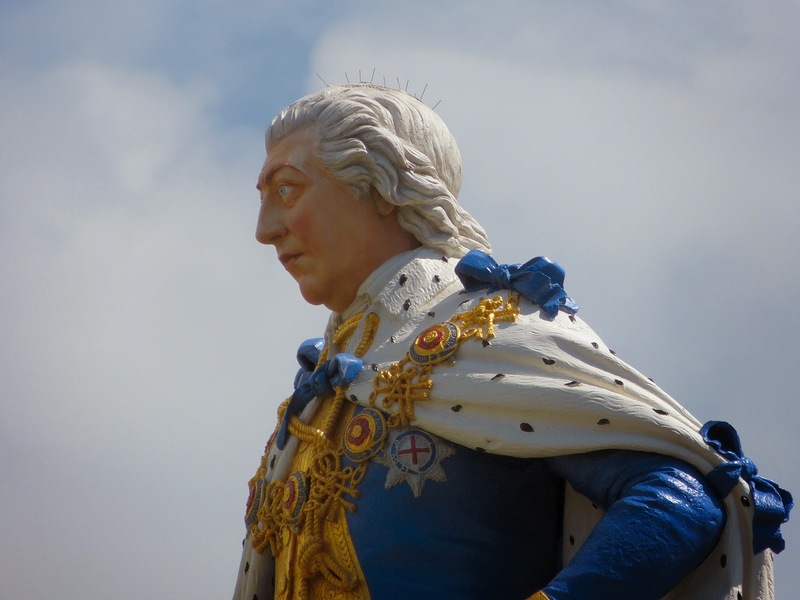 Being an equerry to George III was hard work! He rose early, seemed to have boundless energy and spent much of his time outdoors, whatever the weather. “go no farther than the fiddling-room. As to the queen, we don't see her week after week sometimes. The king, indeed, comes there to us, between whiles, though that's all as it happens, now Price is gone. He used to play at backgammon with Price." "Then what do you do there?" • General Thomas Garth - who was rumoured to have fathered a child by Princess Sophia. 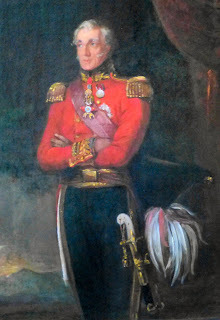 • General Charles Fitzroy, 2nd son of 1st Baron Southampton - who was loved by Princess Amelia. (1) From Oxford Dictionaries online. (2) From The Book of the Court by WJ Thoms (1838). (3) From an entry dated 13 August 1786 in Diary and Letters of Madame D'Arblay by Fanny Burney (1842). (4) From an entry dated 7 August 1786 in Diary and Letters of Madame D'Arblay by Fanny Burney (1842). (5) From an entry dated 28 July 1786 in Diary and Letters of Madame D'Arblay by Fanny Burney (1842). (6) From an entry dated 2 August 1786 in Diary and Letters of Madame D'Arblay by Fanny Burney (1842). (7) From an entry dated 8 June 1787 in Diary and Letters of Madame D'Arblay by Fanny Burney (1842). (8) From Wraxall’s Posthumous Memoirs of his own time Volume III p137 (1836). (9) From an entry dated 6 October 1786 in Diary and Letters of Madame D'Arblay by Fanny Burney (1842). (10) From an entry dated 10 December 1786 in Diary and Letters of Madame D'Arblay by Fanny Burney (1842). (11) From an entry dated 24 July 1786 in Diary and Letters of Madame D'Arblay by Fanny Burney (1842). (12) From an entry dated 26 December 1786 in Diary and Letters of Madame D'Arblay by Fanny Burney (1842). 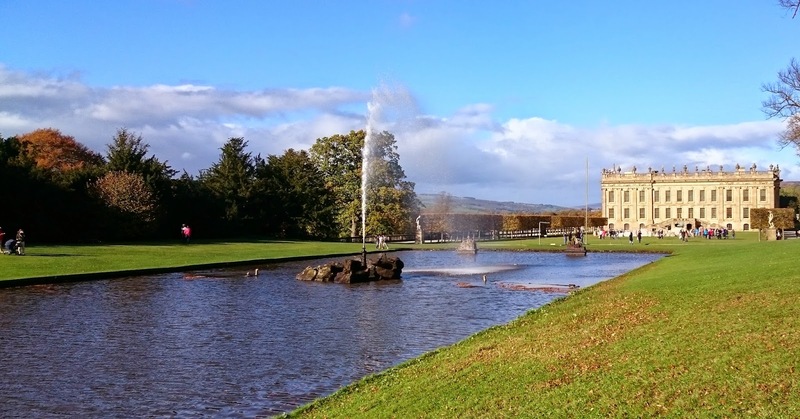 Another post by my husband Andrew, inspired by our visit to Derbyshire. 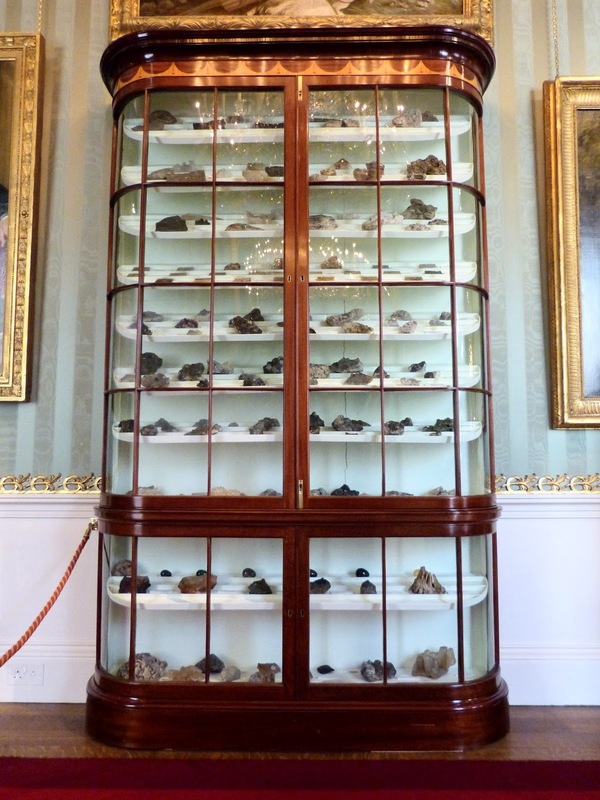 One of the less well known facts about Georgiana Cavendish, Duchess of Devonshire and leader of fashion in the late eighteenth century, was that she collected rocks. 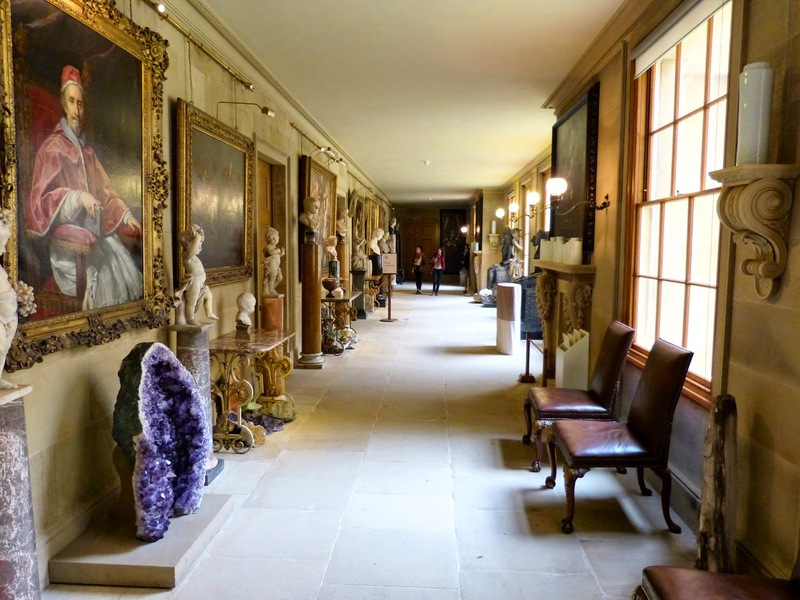 Visitors to Chatsworth, home of the Duke of Devonshire, can view her mineral collection, along with vases and bowls made from Britain's rarest semi-precious stone, Blue John. 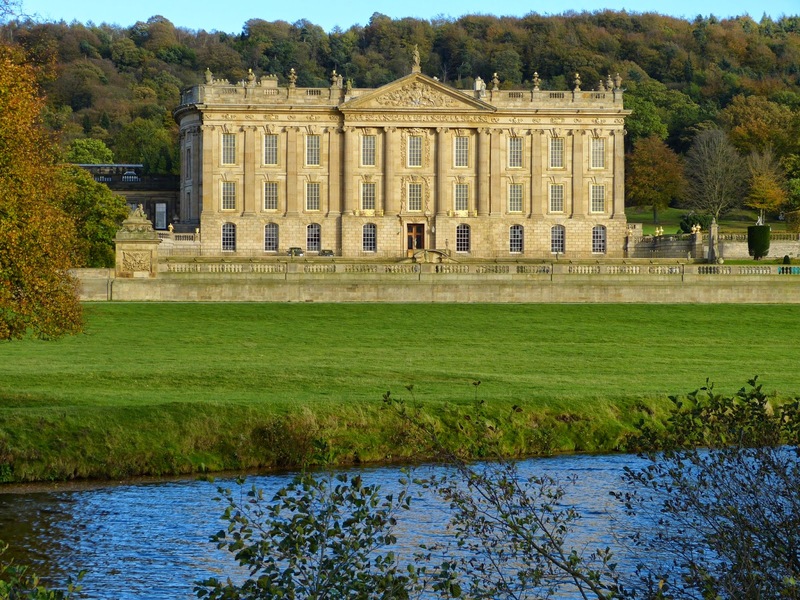 The mineral became hugely popular with craftsmen and their customers in the late Georgian period, and coincidentally its only known source was just a few miles from Chatsworth, in the hills above Castleton. Blue John is found nowhere else in the world. It is still mined today, but only in tiny quantities as very little remains in the ground. The two remaining mines, which are mainly natural caverns, are now largely tourist attractions. 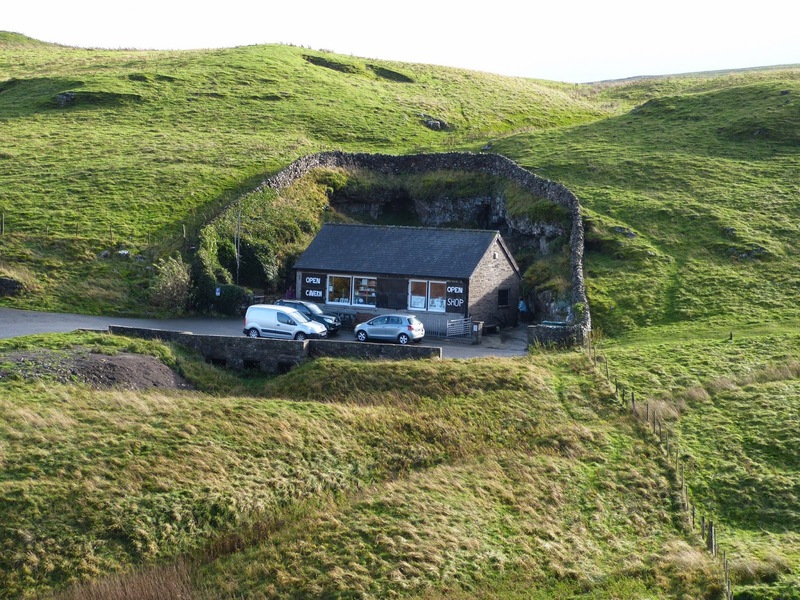 Lead has been mined around Castleton for hundreds of years, possibly even by the Romans, and mining records began in 1280. But there is no reference to the mining and use of Blue John before the 1760s. 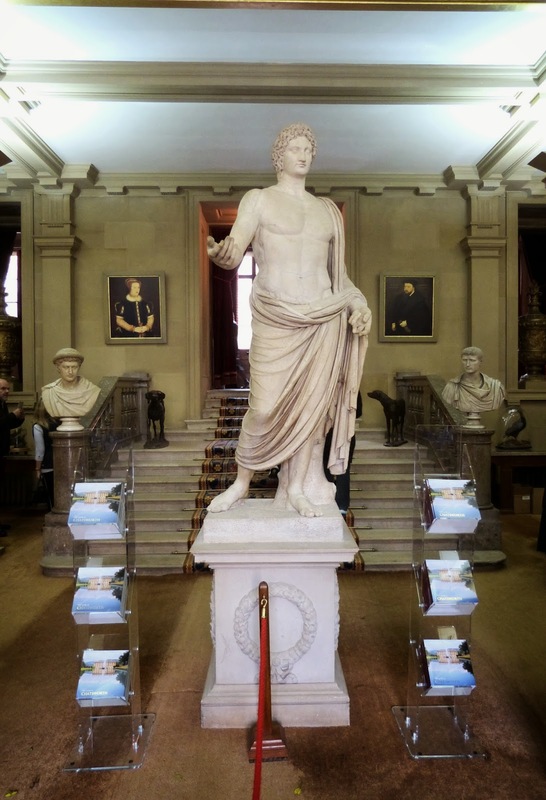 Trevor Ford, in his book Derbyshire Blue John, explores and debunks stories of Blue John ware being found in Roman Pompeii. 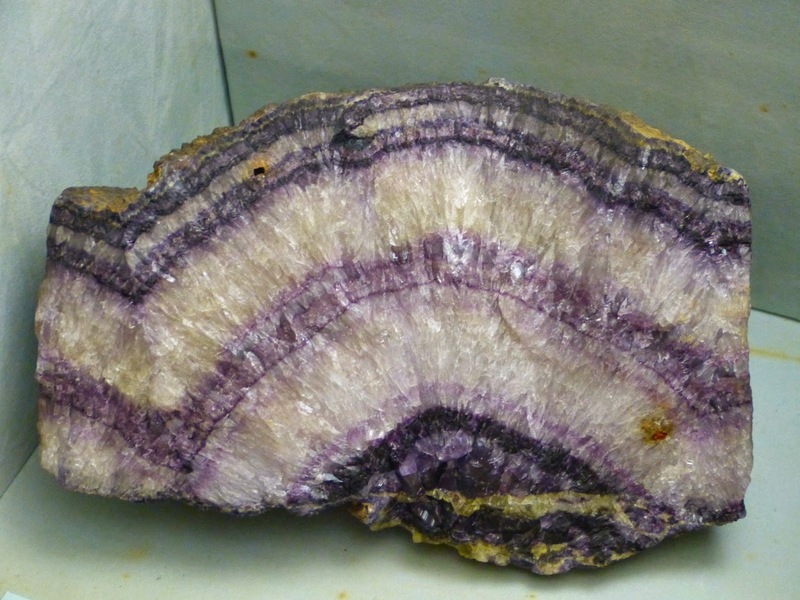 Blue John is a form of fluorspar, a common mineral that occurs in many colours. 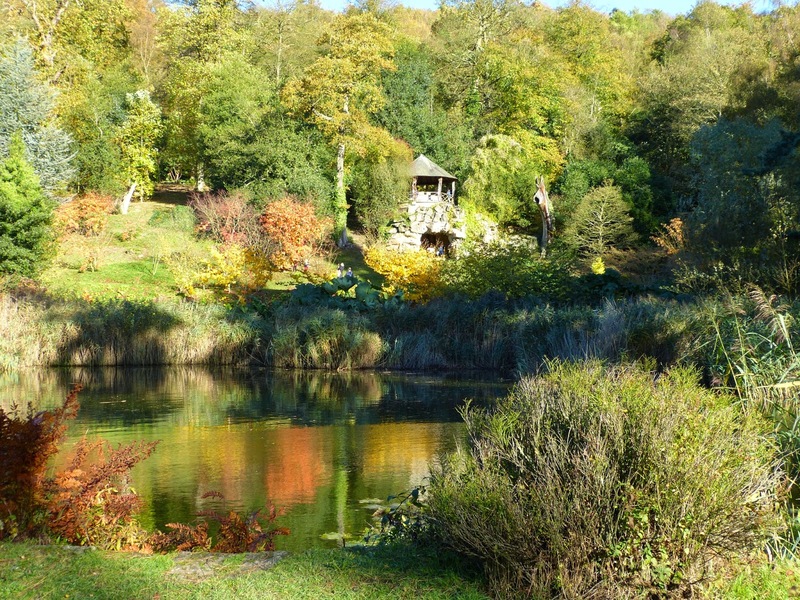 What makes it unique to Derbyshire is the particular colouring, with bands of purple and blue, yellow and off-white. Formed in the cracks within limestone, no two sections of Blue John are alike. Where the bands of Blue John reached the surface, they would have been visible. 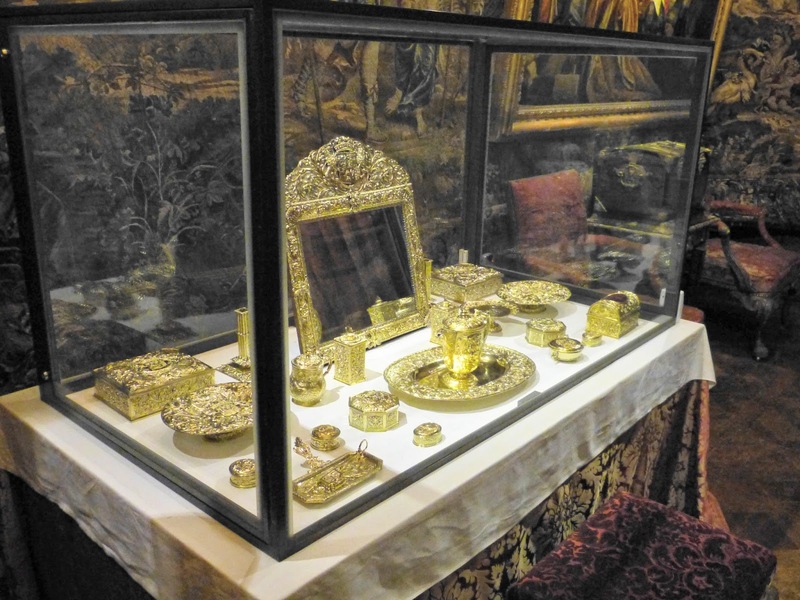 Seventeenth century travellers refer to azure or sapphire spar being found in the Peak District but say nothing about it being mined or used in any way. 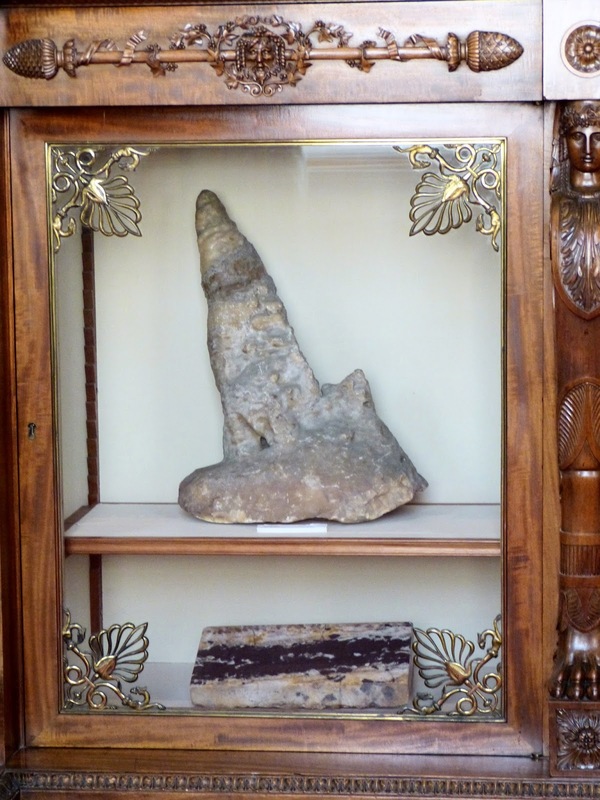 All that changed in the 1760s, when the name 'Blue John' appeared in guidebooks and the mineral was used in ornaments. 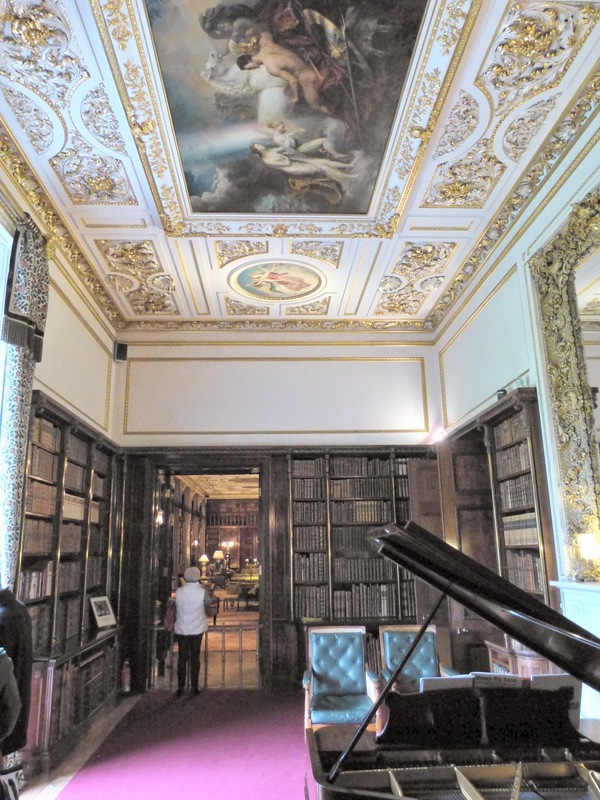 Robert Adam inlaid Blue John into fireplaces at Kedleston Hall and manufacturer Matthew Boulton used it extensively. 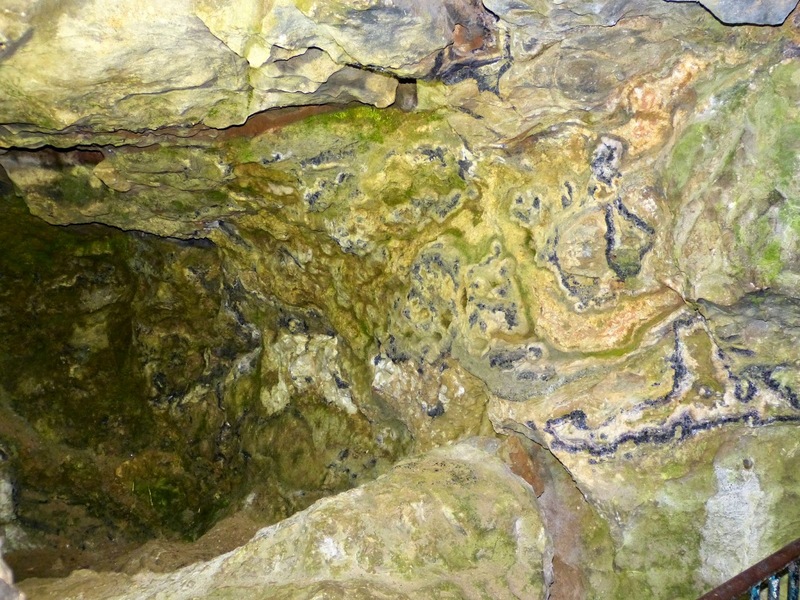 The lead miners of Castleton must have observed Blue John as they went about their business underground. In naturally formed caverns, loose pieces of both lead and Blue John would be mixed in with the silt that filled the caves, and which the miners dug out and searched through for minerals. Digging Blue John out of the cave walls demanded some skill, as it is relatively fragile. The limestone around the mineral would have been chipped away to release it, with miners using various techniques to break into the rock walls. One of these ways was to push wooden pegs into cracks, then soak the wood with water, causing it to swell and break the crack open further. Another approach was to light a fire against a wall, leave it to burn overnight, then throw water against the wall. The sudden change in temperature would cause it to crack. 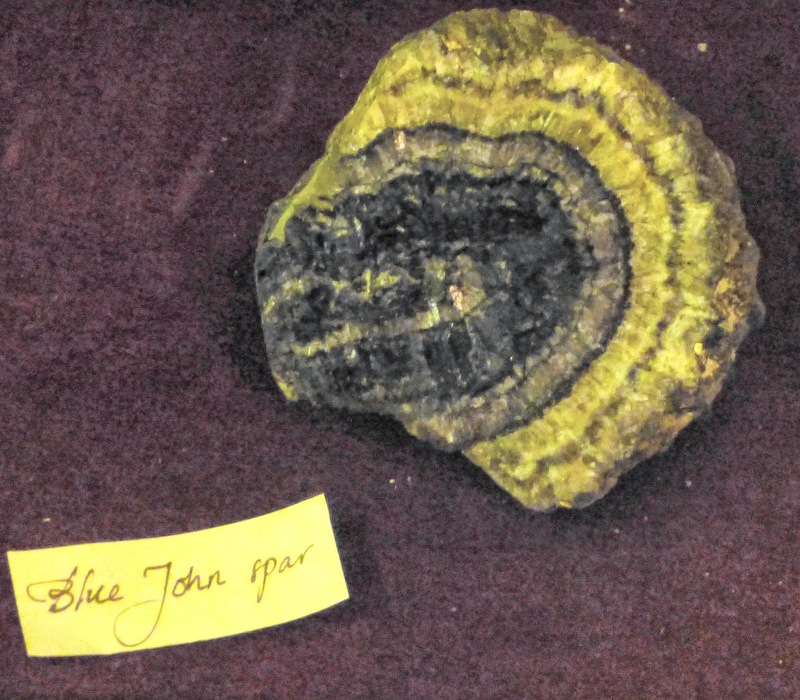 Having been extracted, Blue John had to be dried for a year or two before it could be worked without damaging it structure. Because it is relatively soft, Blue John is easily damaged. 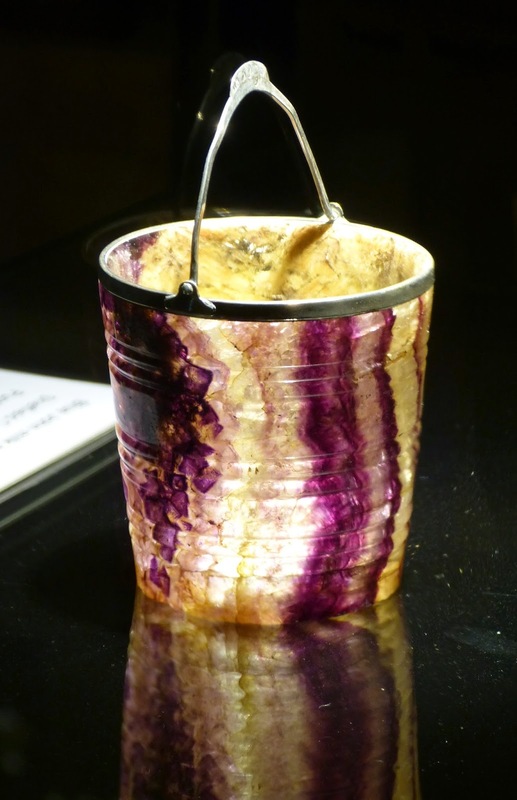 Many objects are coated in resin to protect them and the process of applying this resin was often regarded as a trade secret. 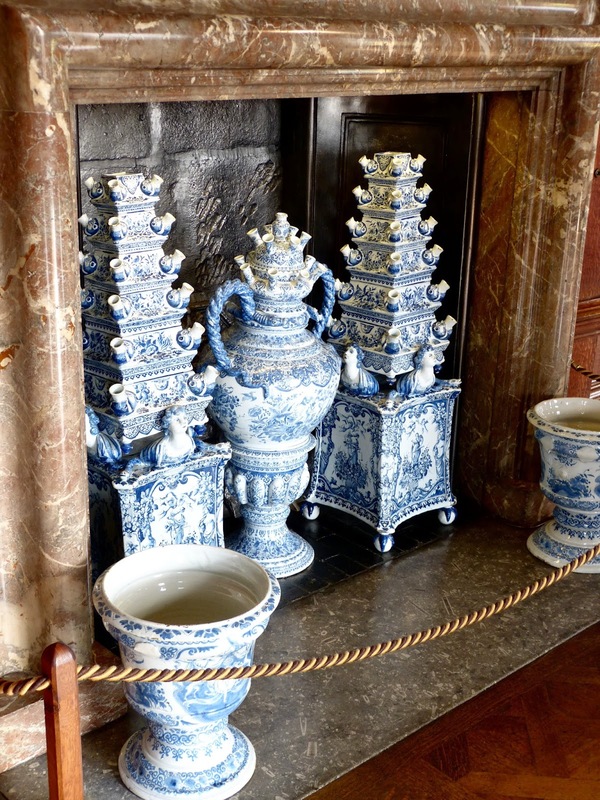 A year later, Boulton bought 14 tons of best quality Blue John, from which he made vases, candelabra and other ornaments. 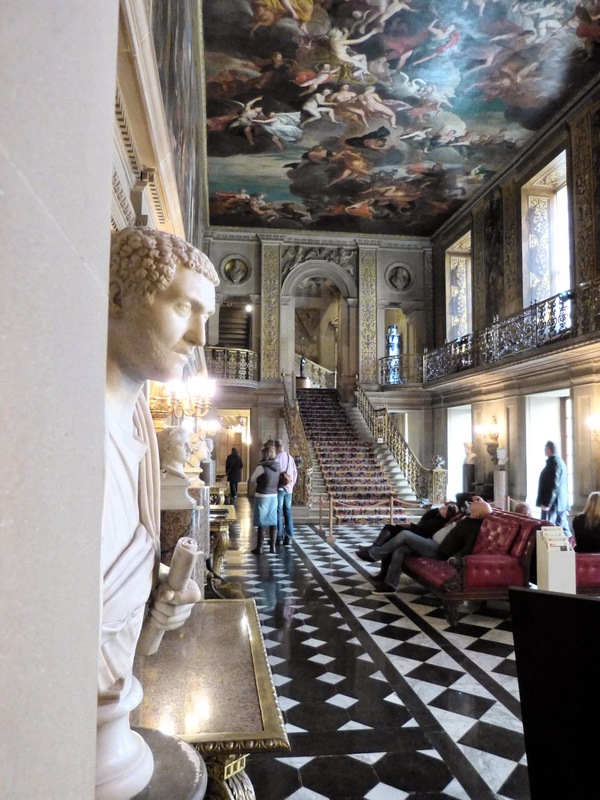 Some survive in Britain's great houses, including Buckingham Palace. A tourist trade developed around the Blue John mines in the early 1800s, although going underground remained difficult. 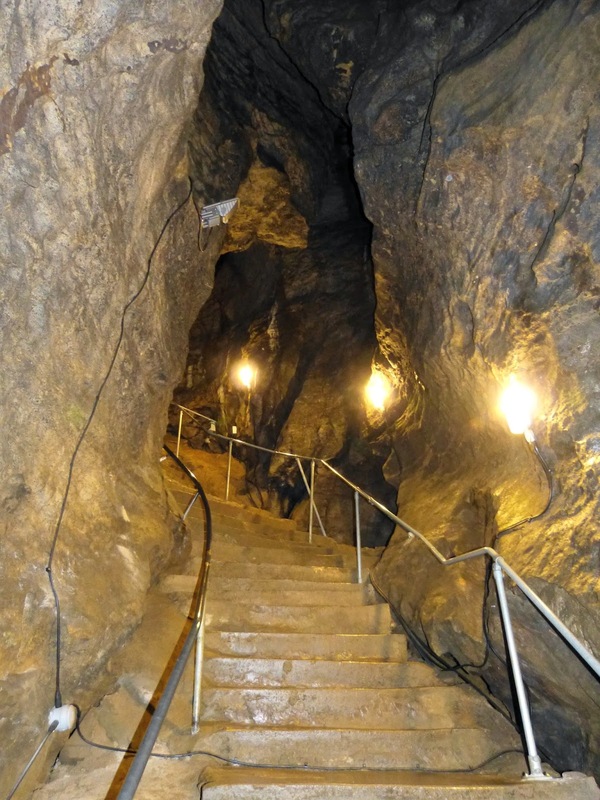 It wasn't until 1836 that a new, easier path was cut through the rock into the Blue John Cavern mines, and concrete steps were not laid until the early twentieth century. But by the time Adam was exploring the Blue John mines, the mineral was already starting to fall from favour and the latter half of the nineteenth century saw the small industry decline sharply. The stone is still being mined today, although in very small quantities. The supply of this rare mineral, highly prized by Georgian gentry, could be exhausted within the next decade. Unsurprisingly, given its proximity to the source of Blue John, the house contains several vases and other ornaments and even a window made of Blue John. 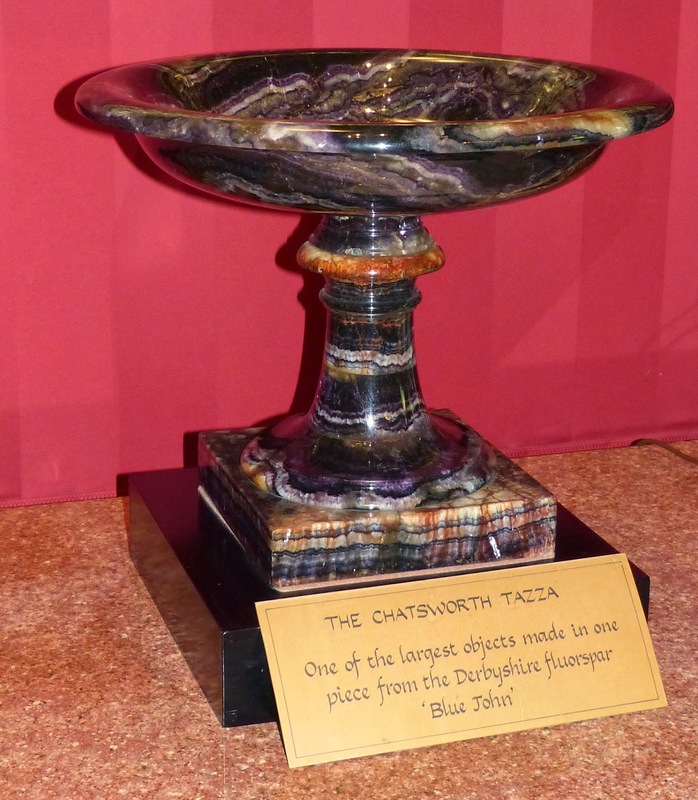 The collection includes the Chatsworth Tazza, the largest single-piece ornament, made in 1842, and currently on display in the dining room. 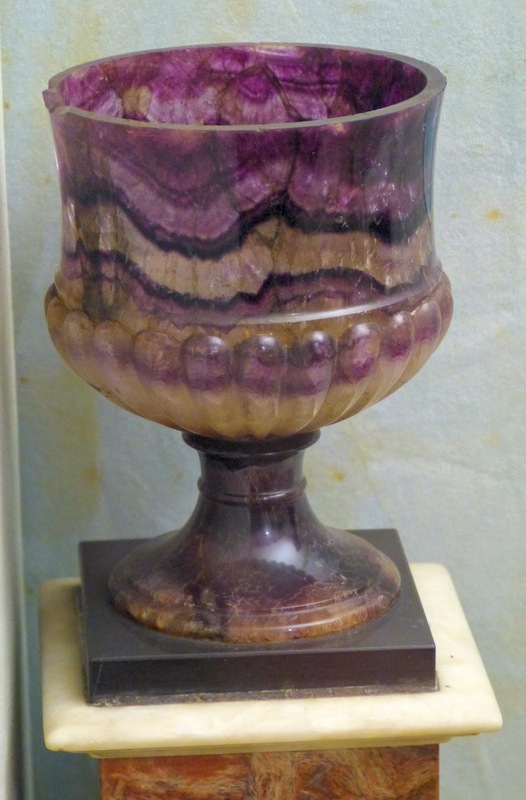 The house also contains the Shore vase, made in 1815, although it's not clear whether this is on public display. 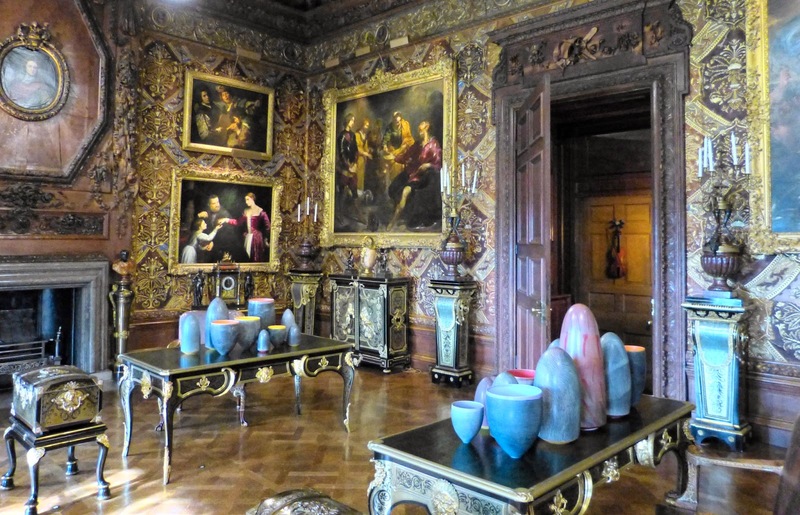 Here you can see several Blue John vases. According to Ford, the collection includes what is probably the largest Blue John vase ever made, created by John Vallance around 1840. 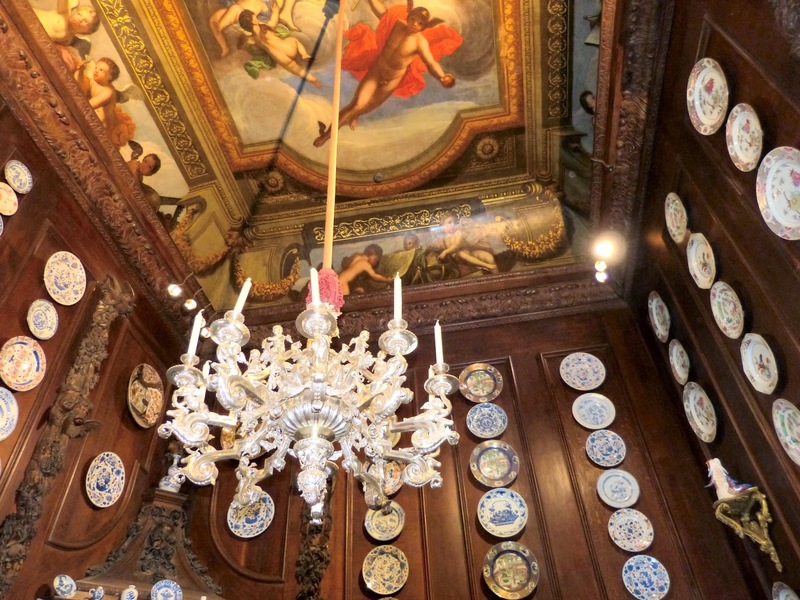 This museum houses a collection of over 80 Blue John ornaments from the late eighteenth century. 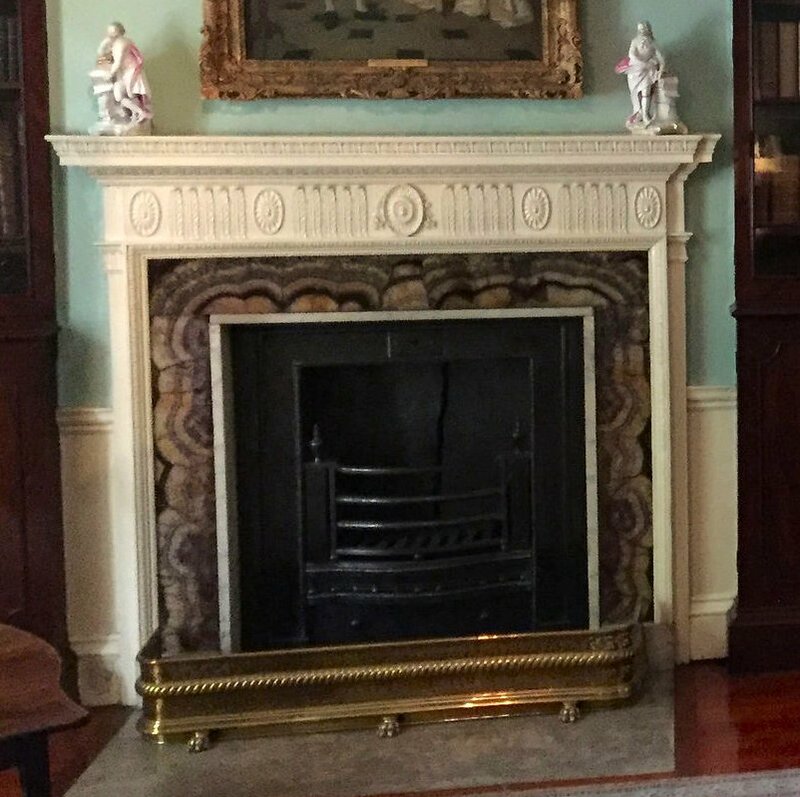 Fireplaces containing Blue John can be found at Kedleston Hall and the Georgian House Museum in Bristol (see below). Others exist, but are less accessible to the public. (1) From Sketch of a Tour into Derbyshire and Yorkshire by William Bray (1777). (2) Quoted in Derbyshire Blue John by Trevor Ford (2005) p64. (3) From The Gem of the Peak by William Adam (1838). Philae, a robotic probe, landed on a distant comet today. The European Space Agency hopes that the information that it gathers will help scientists understand the early development of the Solar System. 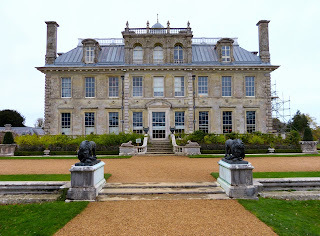 It shares its name with the Philae obelisk which stands at Kingston Lacy. 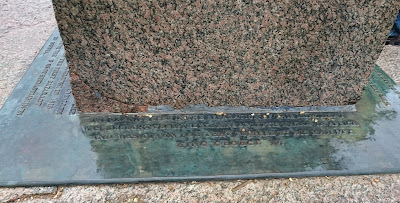 The inscriptions on this obelisk helped Georgian scholars to understand Egyptian hieroglyphics. The Philae obelisk was discovered by William John Bankes on his first journey into Egypt in 1815. The pink granite needle was one of a pair in front of the Temple of Isis on Philae, an island in the Nile. The island has since been flooded as a result of the building of the Aswan Dam. Giovanni Finati acted as Bankes' guide and his travel journals give details of some of Bankes’ excavations. 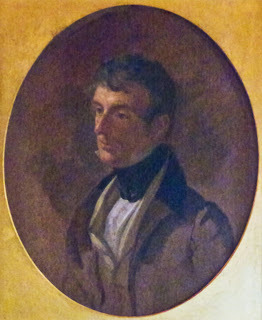 On his second journey into Egypt in 1818-19, Bankes’ party included Henry Beechey, son of Sir William Beechey, the famous portrait painter; Dr Alessandro Ricci; Louis Linant de Bellefonds, a French midshipman; and Giovanni Belzoni. After starting out as a performing strong man at Sadler’s Wells, Belzoni had become a hydraulic engineer specialising in the excavation of Egyptian antiquities. 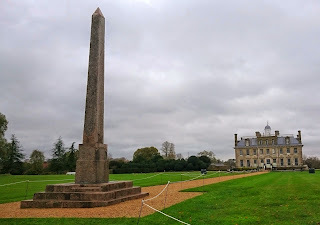 Bankes employed Belzoni to take the Philae obelisk back to his family home of Kingston Lacy in Dorset, England. The obelisk arrived in England in 1821 and the Duke of Wellington offered to send a gun carriage to transport it to Kingston Lacy. It was damaged in transit and had to be repaired using some granite from the ruins of Leptis Magna – a prominent city in the Roman Empire situated in what is now Libya – given to Bankes for the purpose by George IV. A monument to tax exemption! 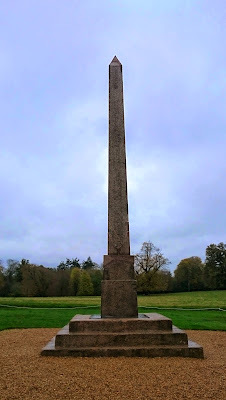 The Duke of Wellington chose the spot in the garden, south of the house, for the site of the obelisk. 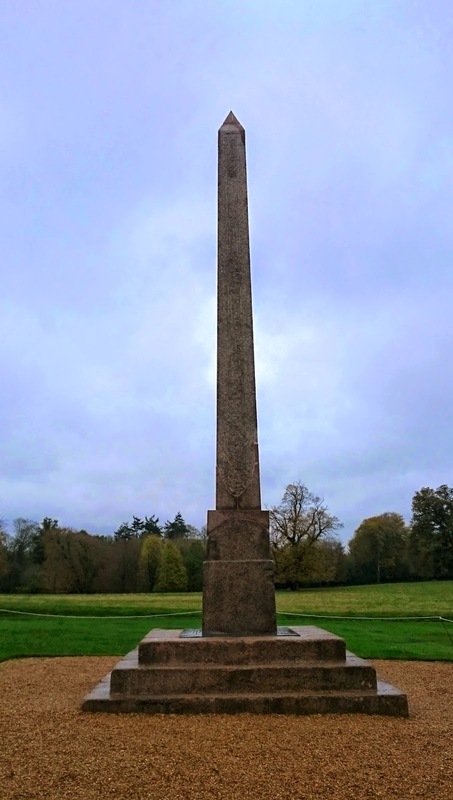 He laid the foundation stone in 1827, but it was not until 1839 that the obelisk was finally erected. AS A PERPETUAL MEMORIAL OF EXEMPTION FROM TAXATION. Bankes studied the obelisk carefully, and found he could make out the names of Ptolemy and Cleopatra. He made lithographs of the bilingual inscriptions – both Greek and hieroglyphic - and this helped scholars in their understanding of hieroglyphics. Recently, a new study has been conducted on the obelisk. Current researchers have been able to confirm that Bankes’ lithograph, particularly of the hieroglyphs, was very accurate. Modern imaging methods have made it possible to read the whole of the Greek inscription for the first time. Much of this had been worn away by the time the obelisk arrived at Kingston Lacy. (1) From Finat's Life and Adventures (1830). (2) A cataract is a large waterfall. (3) An inundation is a flooding. (4) Finati mentioned four blocks of granite, but only three were used in the platform for the obelisk. It is not clear whether only three were transported or whether Finati remembered incorrectly. 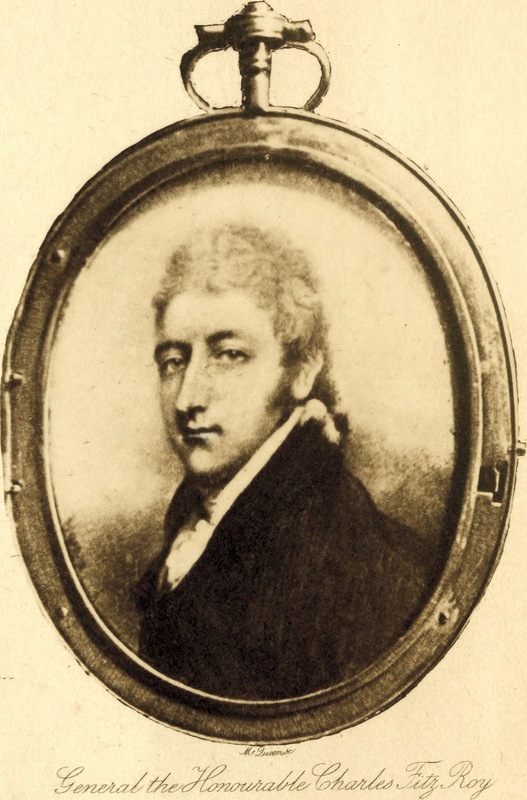 (5) William John Bankes was the second, but eldest surviving son of Henry Bankes. His elder brother Henry died in 1806. 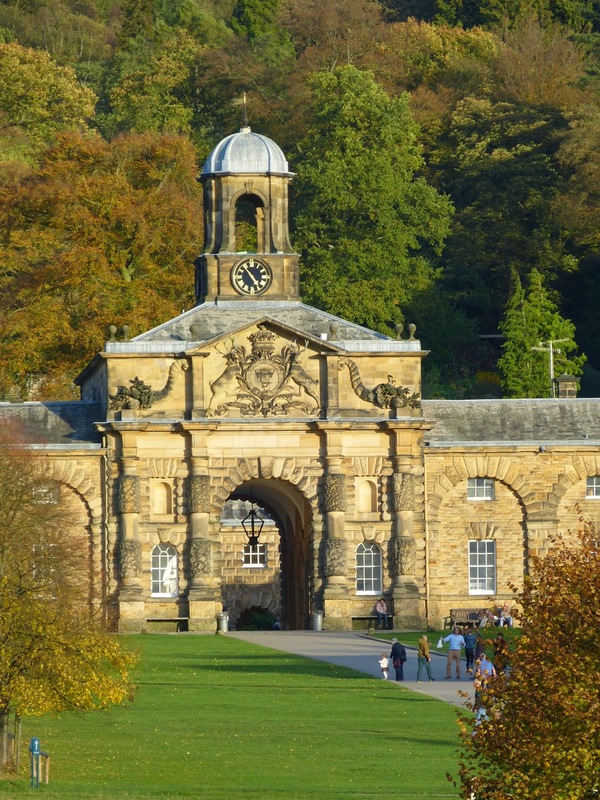 A post by my husband Andrew Knowles inspired by our recent travels into Derbyshire. Sometimes Regency history takes us by surprise. Only this week, I learned about a significant historical event that occurred during the Regency and my introduction was via a very modern road sign. Driving through the small village of Pentrich, Derbyshire, I noticed that the village sign was topped with the phrase: "Revolution 1817." 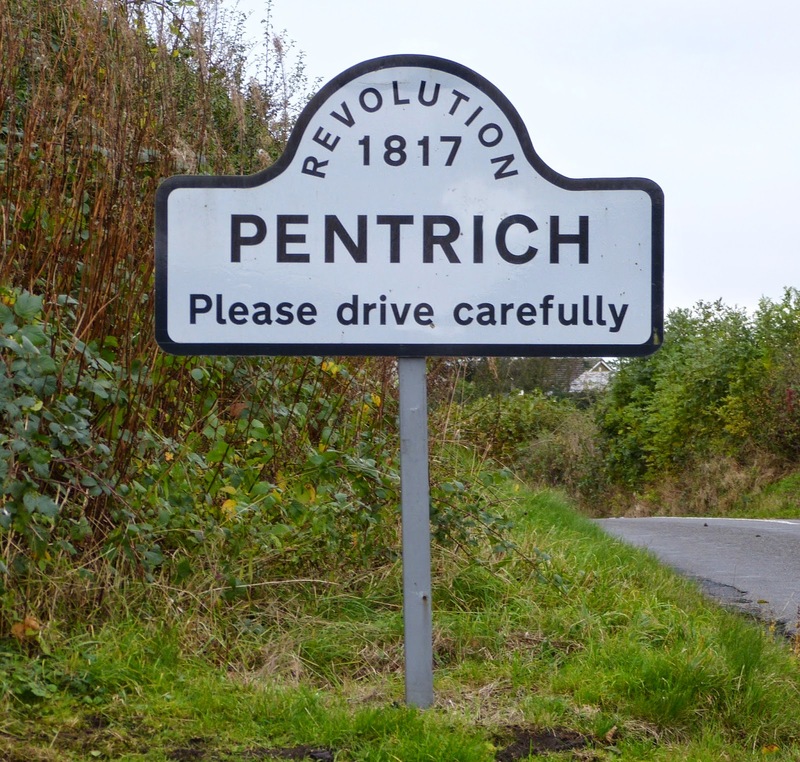 Perhaps you already know about the Pentrich Revolution. I didn't, and here is what I have since discovered. "The mischiefs flowing from oppression"
Discontent was rife in England during the early nineteenth century. The Industrial Revolution brought unsettling change, the Corn Laws pushed up food prices, and what many considered to be unfair taxes put a huge burden on the working population. Many ordinary people, particularly in the Midlands, considered themselves to be oppressed. Political agitation for change took various forms. The Luddite movement attacked industrial machines between 1811 and 1813. Debating groups, known as Hampden clubs, sprang up across the country. There was a growing appetite for reform, particularly of the way the nation was governed. Many wanted to bring about change without violence, but the government was fearful of the large crowds the agitators could muster. The Seditious Meetings Act of March 1817 banned assemblies of more than 50 people. 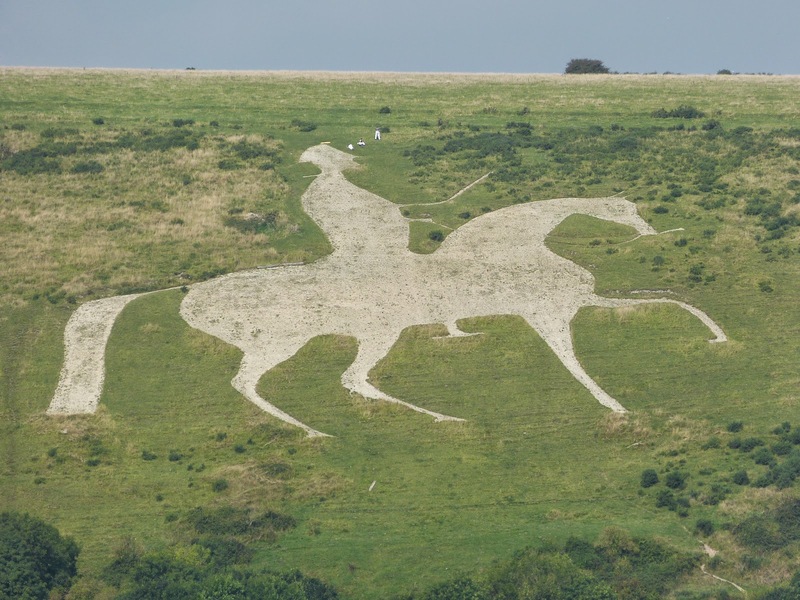 the White Horse Inn which stood near here." In their enthusiasm to detect trouble, the government dispatched several spies. One of these, William Oliver, became involved with political meetings taking place at Pentrich (then often spelled Pentridge). It seems likely that Oliver went beyond his role as observer and actively encouraged the frustrated group to take direct action. On the evening of 9 June 1817, a group of several hundred men from around Pentrich gathered in a barn in nearby South Wingfield. 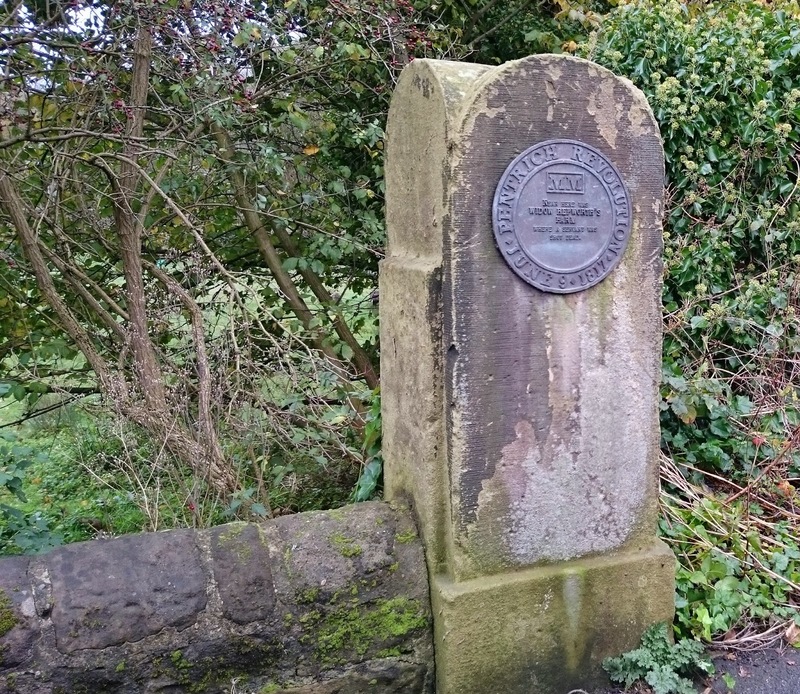 Under the leadership of Jeremiah Brandreth, a 27 year old stockinger, they began marching towards Nottingham. It seems they believed a larger uprising would happen across the country, leading to political change. As they marched, they sought to recruit others and in one encounter, Brandreth killed someone. But as the night wore on and rain soaked his band, their numbers decreased until by dawn, only a small group crossed into Nottinghamshire to face a detachment of the King's Hussars. Some were arrested, while others fled. Farm where a servant was shot dead." Brandreth, along with Isaac Ludlam and William Turner, was found guilty of High Treason and were sentenced to be hung, drawn and quartered. This is apparently the last time this sentence was given but the Prince Regent showed 'clemency' by reducing the punishment to hanging followed by beheading. Another 14 men were sentenced to transportation, from which none ever returned. A further six were imprisoned for up to two years. 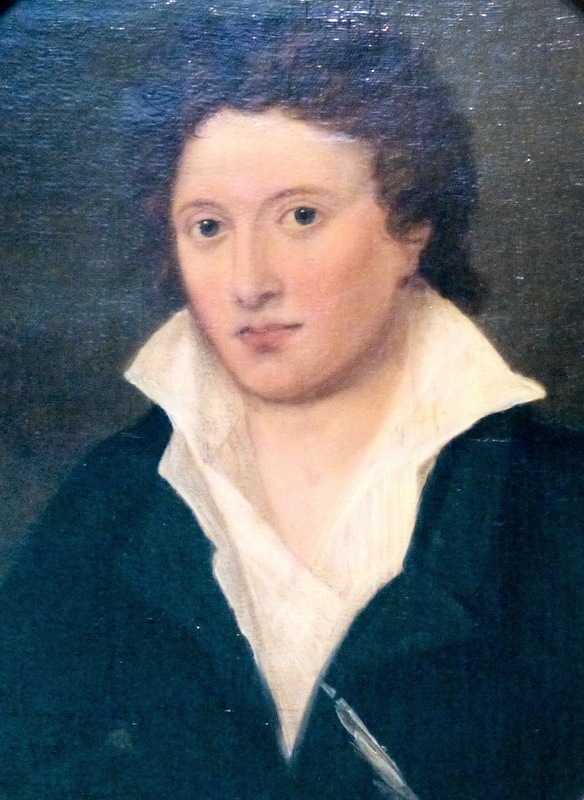 "We pity the plumage, but forget the dying bird"
But what about Princess Charlotte and Percy Shelley, as referred to in the title of this post? 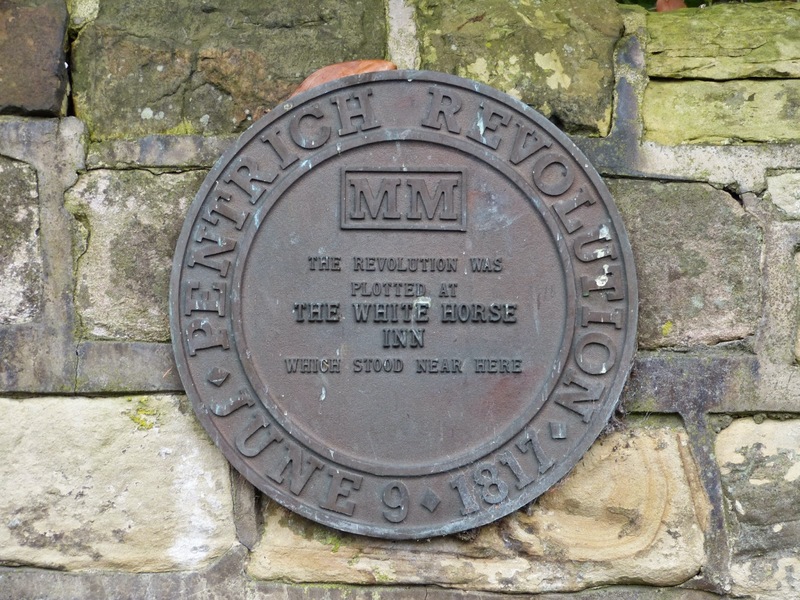 How are they mixed up in the Pentrich Revolution of 1817? 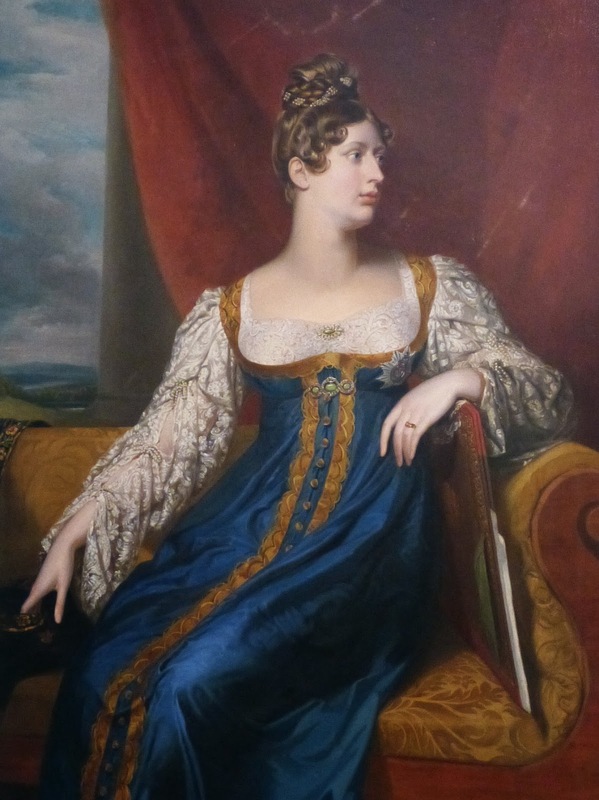 Princess Charlotte, the only legitimate child of the Prince Regent (later George IV), died on 6 November 1817. Adored by the public, her death in childbirth provoked a huge outpouring of grief across the country. 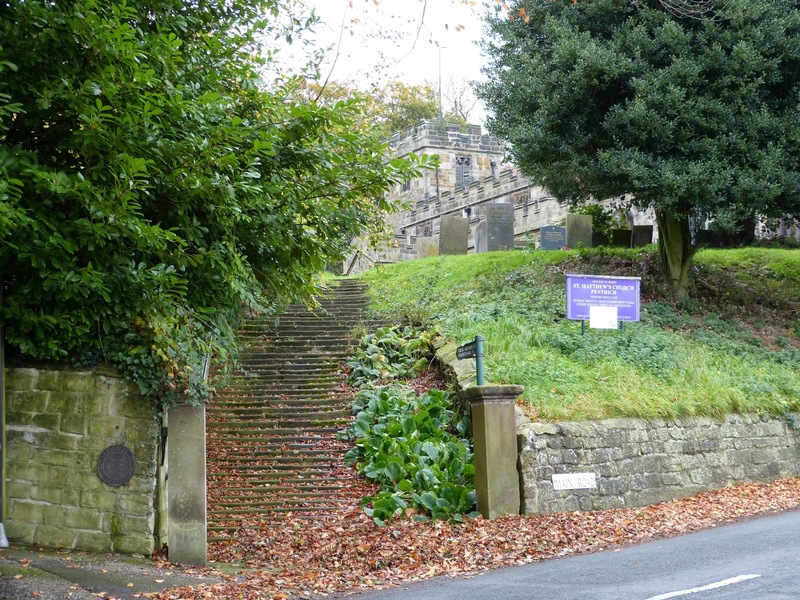 Brandreth, Ludlam and Turner were executed outside Derby Gaol on 7 November 1817, the day after Charlotte died. Their trial and execution for High Treason also attracted national attention. "Mourn then People of England. Clothe yourselves in solemn black. Let the bells be tolled." A beautiful princess is dead, wrote Shelley, referring at once to both Princess Charlotte and to the notion of liberty. Charlotte was "young, innocent and beautiful", and "the last and best of her race". Yet, said Shelley, "the accident of her birth neither made her life more virtuous nor her death more worthy of grief". He had no criticism to make of her, but sought to remind people that the deaths of Brandreth, Ludlam and Turner also provoked grief in those that knew them. "They had sons, and brothers, and sisters, and fathers, who loved them." Shelley was clearly upset by their execution: "Nothing is more horrible than that man should for any cause shed the life of man." He goes on to explain how the government created an oppressive system, with the effect that "the day labourer gains no more now by working sixteen hours a day than he gained before by working eight." It is no surprise to Shelley that people want parliamentary reform and he attacks both the spies who provoked 'rebellion' and the government that dispatched them. "It is a national calamity, that we endure men to rule over us, who sanction for whatever ends a conspiracy which is to arrive at its purpose through such a frightful pouring forth of human blood and agony." "Our alternatives," he wrote, "are a despotism, a revolution, or reform." In that one sentence Shelley sums up the fears or hopes of so many ordinary people in 1817. 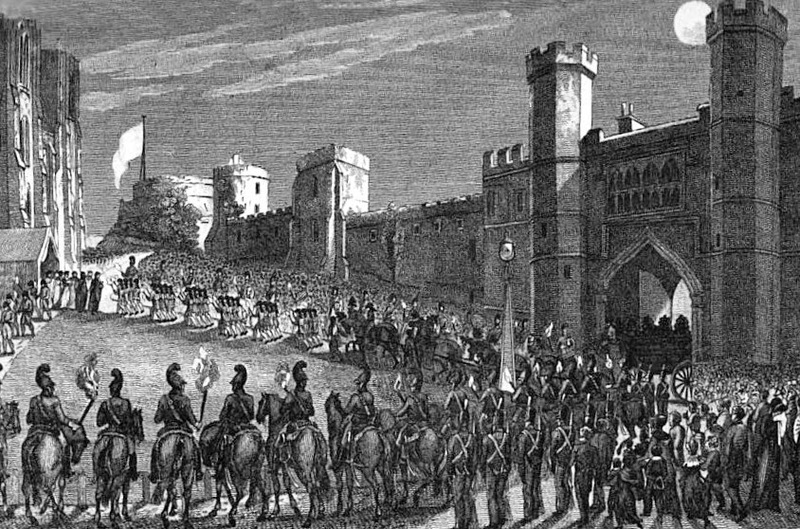 It was these hopes that drove the men of Pentrich to commit what would become, in the eyes of the law, High Treason. All this I have discovered, just because I spotted a word and a date on a road sign. (1) The pamphlet is popularly referred to by this title, but the phrase "We pity the plumage, but forget the dying bird" was a motto and was probably never intended to be a part of the title of this pamphlet. (2) All quotes are from "An Address to the People on The Death of the Princess Charlotte" by Percy Bysshe Shelley (1817). Shelley, Percy Bysshe, The Works of Percy Bysshe Shelley in Verse and Prose, edited by H. Buxton Forman (1880). 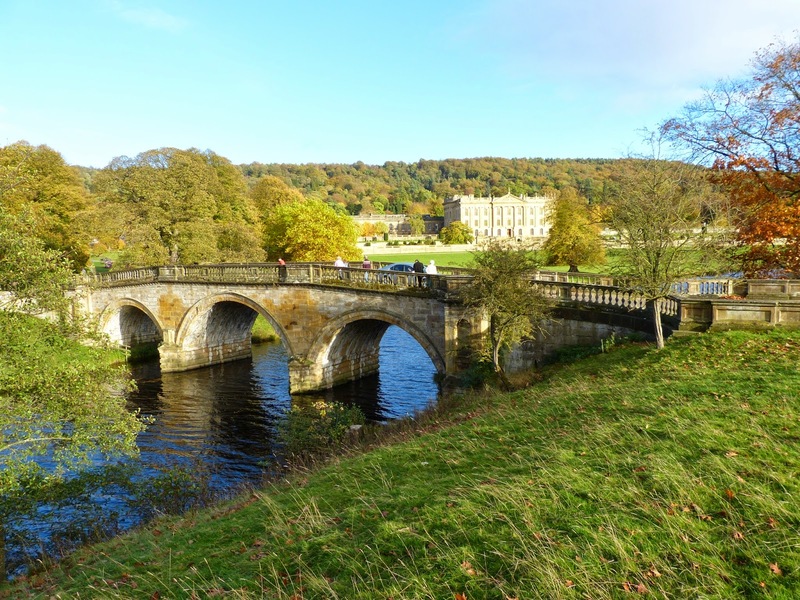 The bridge was designed by James Paine for the 4th Duke of Devonshire (1720-1764) in the 1760s. 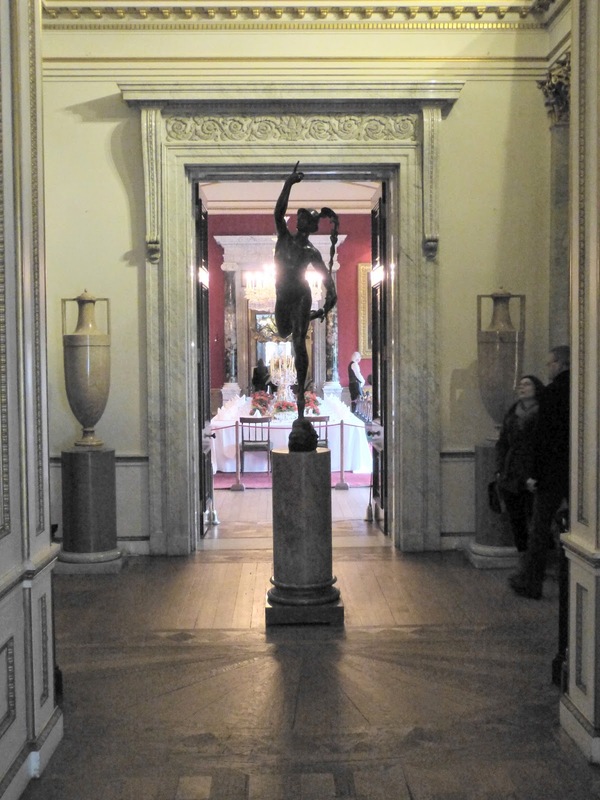 This room was originally the kitchen, but the 4th Duke turned it into an entrance hall in the 1760s. 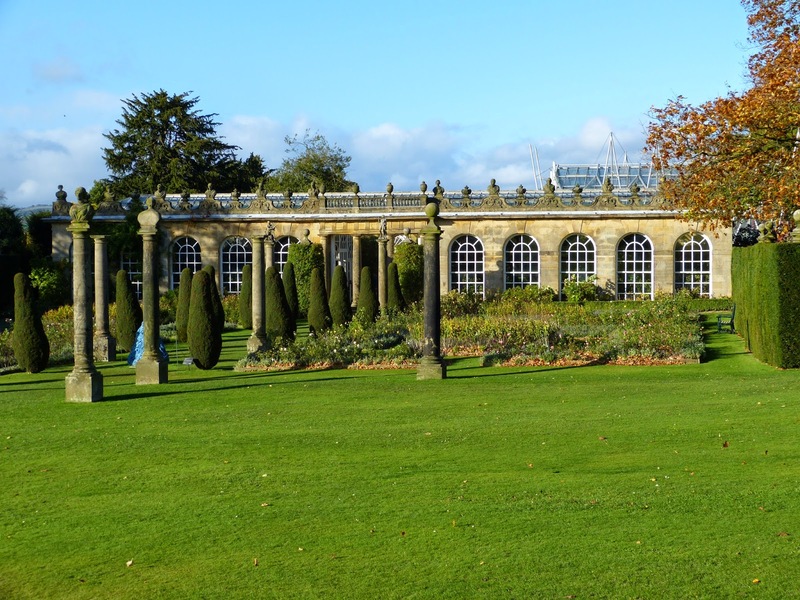 This was originally an open colonnade offering some protection from the weather to visitors as they crossed the Courtyard. 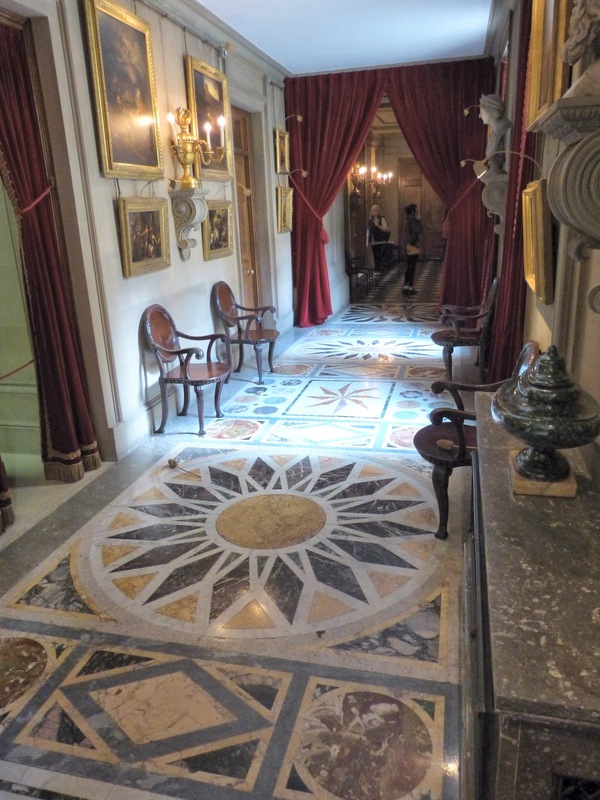 The 5th Duke (1748-1811) laid the first black and white marbled floor in 1779. 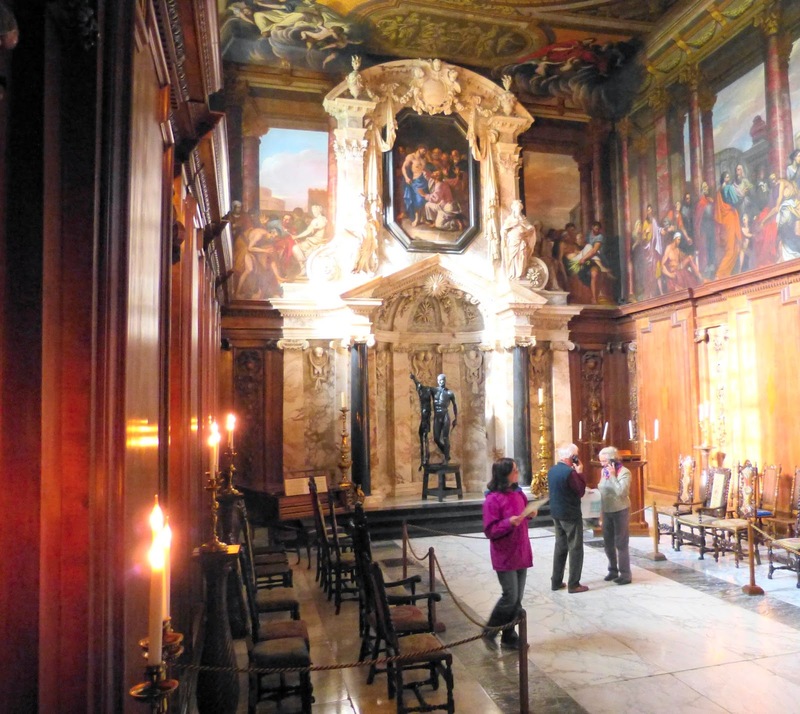 When it was built by the 1st Duke (1640-1707), the Painted Hall was entered through the Courtyard. 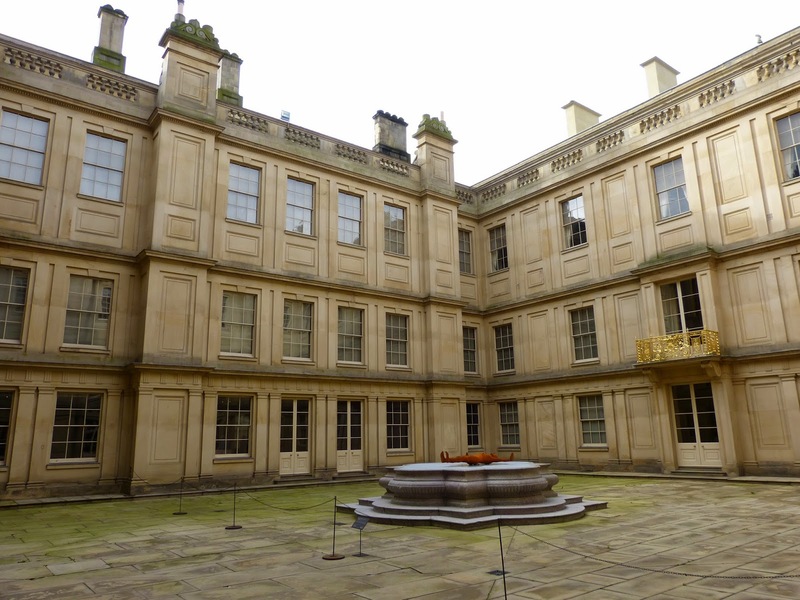 The Painted Hall originally had no ground floor windows; these were added by the 6th Duke in the 1820s. 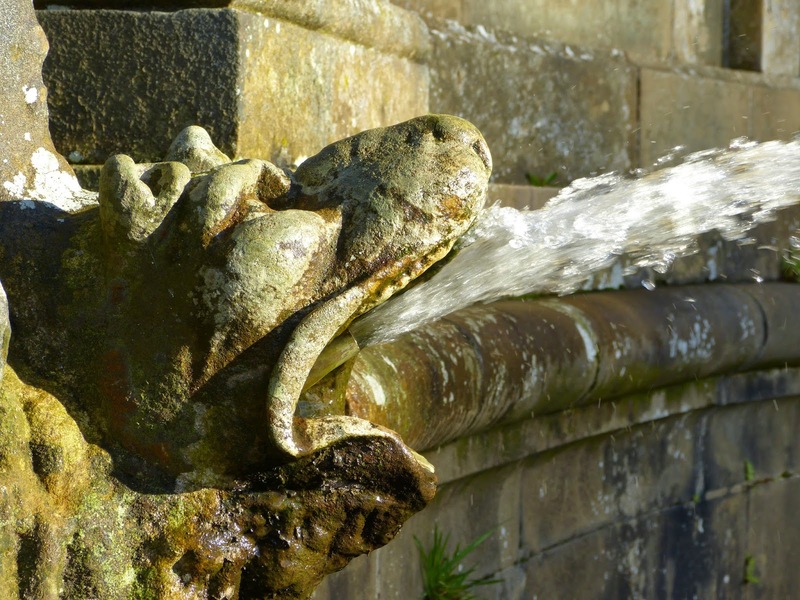 The Grotto was at the heart of the 1st Duke's very modern plumbing system which provided both hot and cold running water. 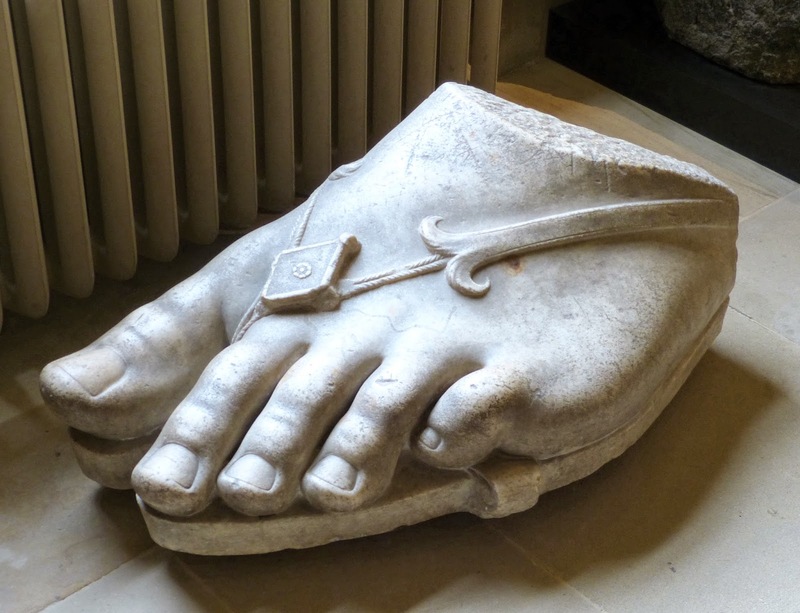 It used to be thought that the colossal foot on display in the Chapel Corridor was a fake from the 19th century, but it is now believed to be part of a genuine 1st century Greek statue. 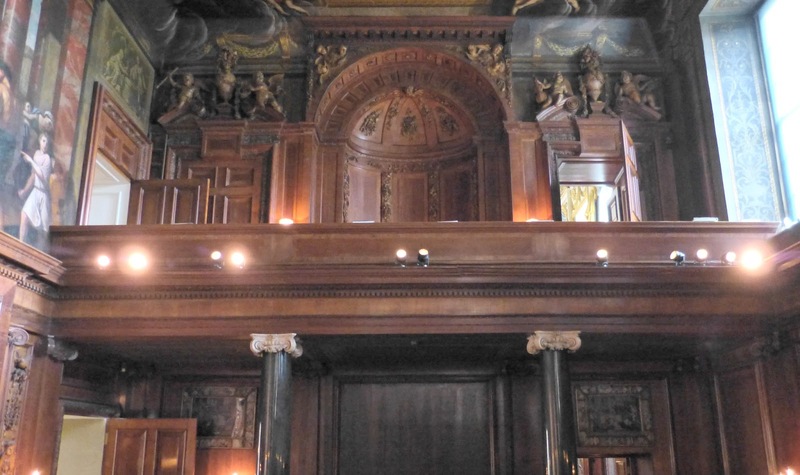 The 6th Duke bought the oak panelling in this room at auction without knowing what he was going to do with it! 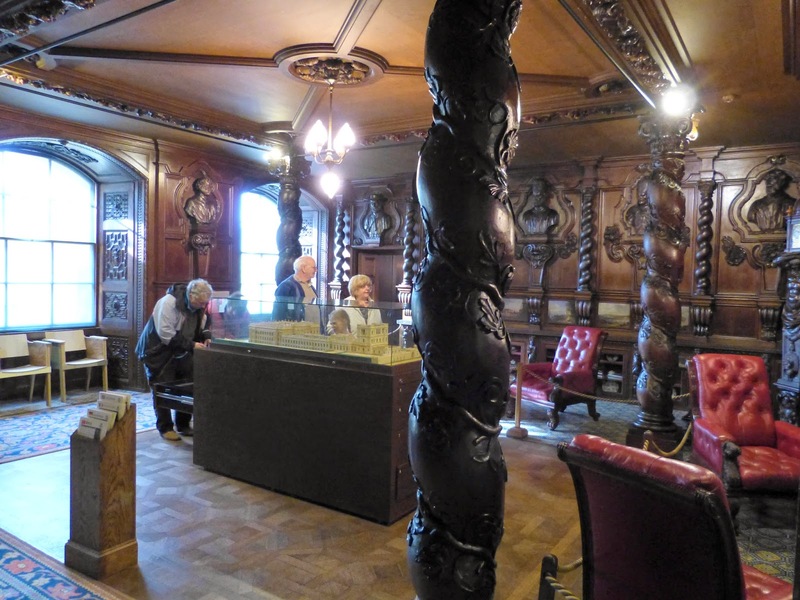 The Chapel has four Ashford black marble columns which were carved from a single block quarried on Sheldon Moor, near Ashford-in-the-Water, just a few miles away from Chatsworth. 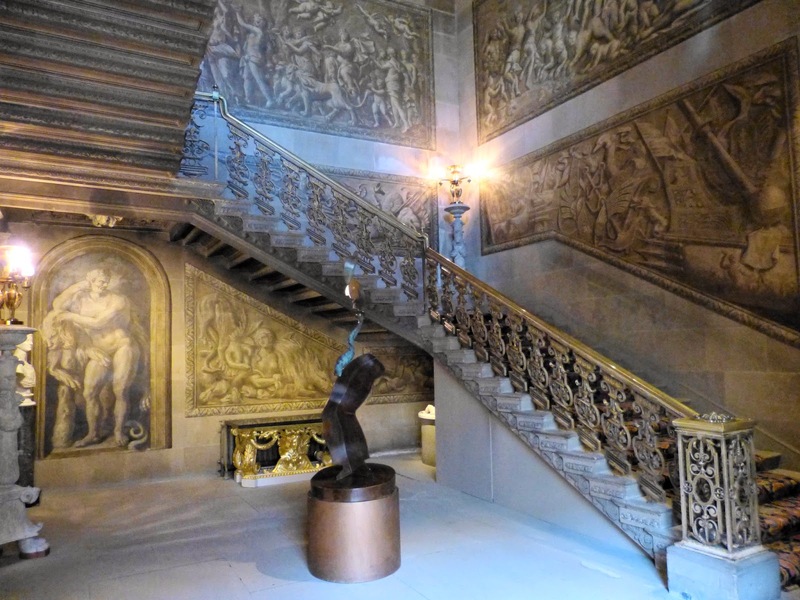 The gilded iron banister was made by William III's ironworker, Jean Tijou. 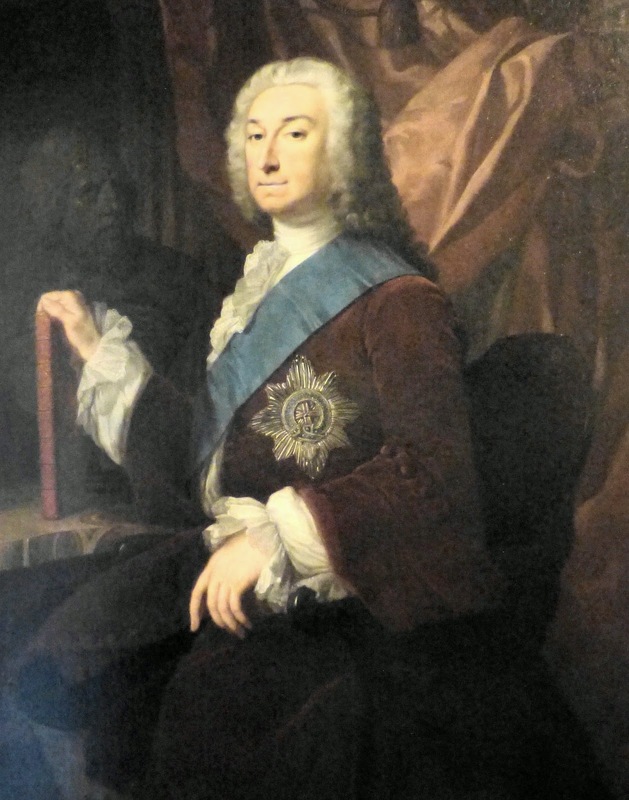 The 1st Duke supported William III and Mary's accession to the throne and was rewarded by his dukedom. He built the State Apartment for their use, but alas, they never visited! 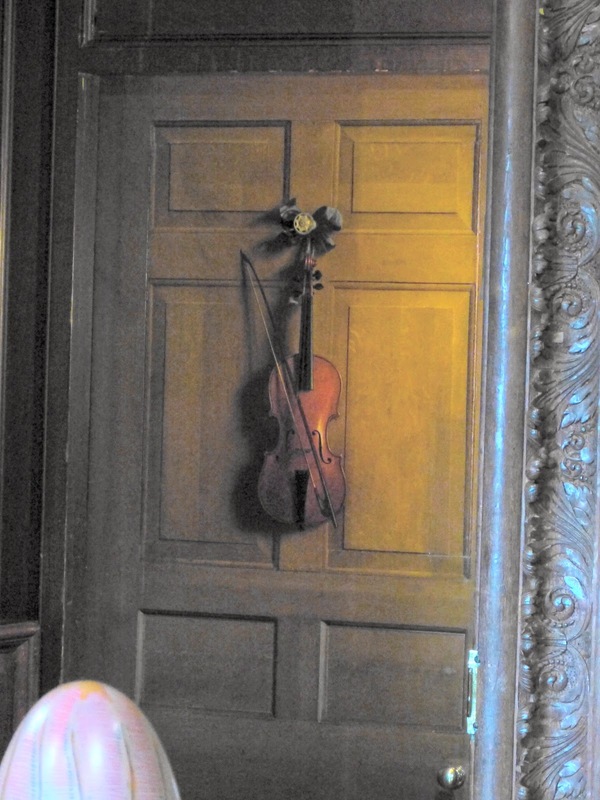 The violin door was brought here by the 6th Duke from Devonshire House, his London home. Despite appearances, the violin is not real but painted. This French silver-gilt toilet set dates from the late 17th century and is engraved with the arms and monogram of William III and Mary. The State Closet was where the King and Queen would have conducted their most important business, should they ever have visited. 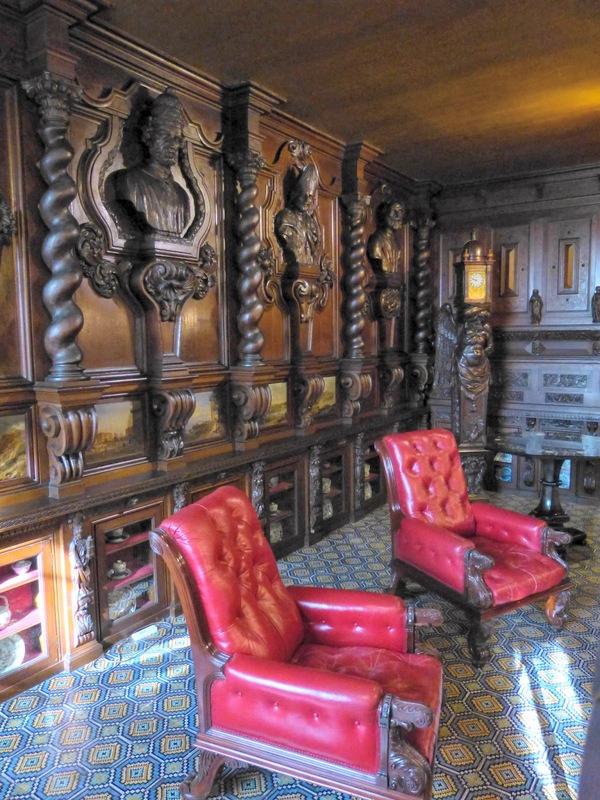 The collection of porcelain displayed on the walls was designed to impress. 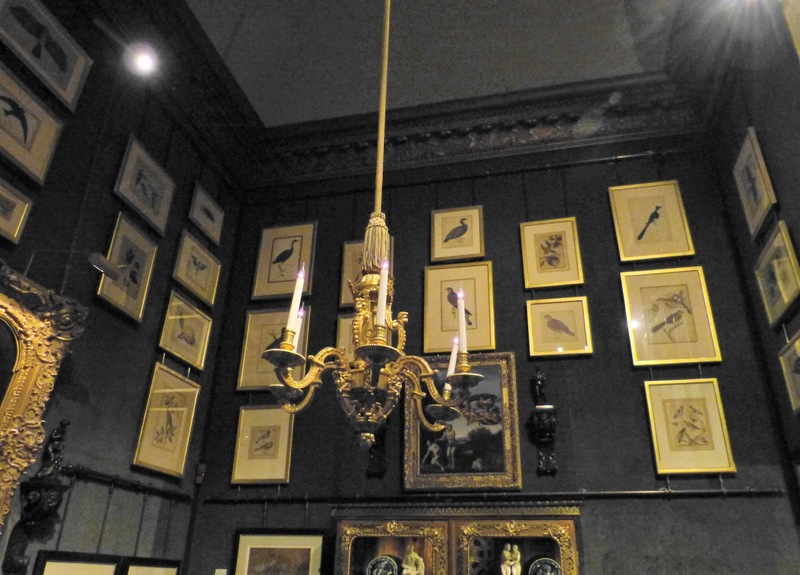 On display is a small selection from the current Duke's collection which consists of over 3000 drawings, mostly collected by the 2nd Duke (1673-1729) and his son, the 3rd Duke (1698-1755). 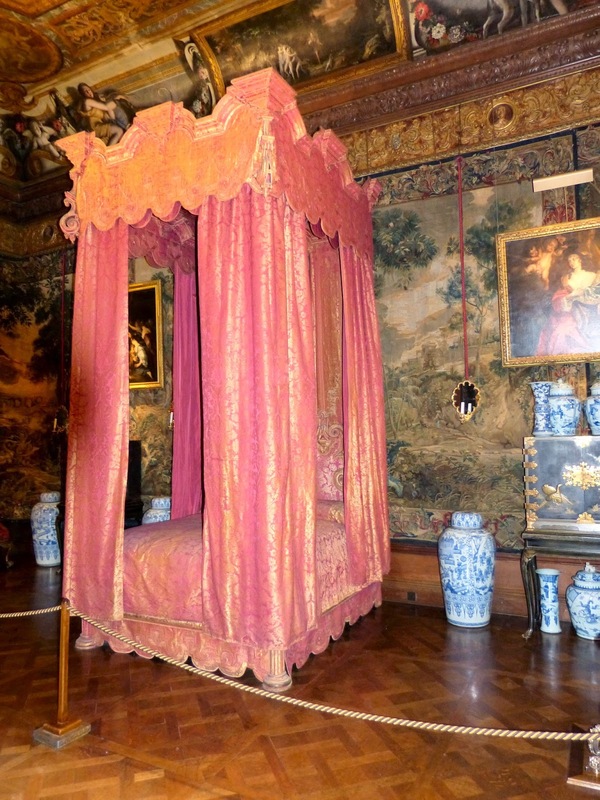 The South Sketch Gallery is devoted to the 5th Duke and his wife, Georgiana. 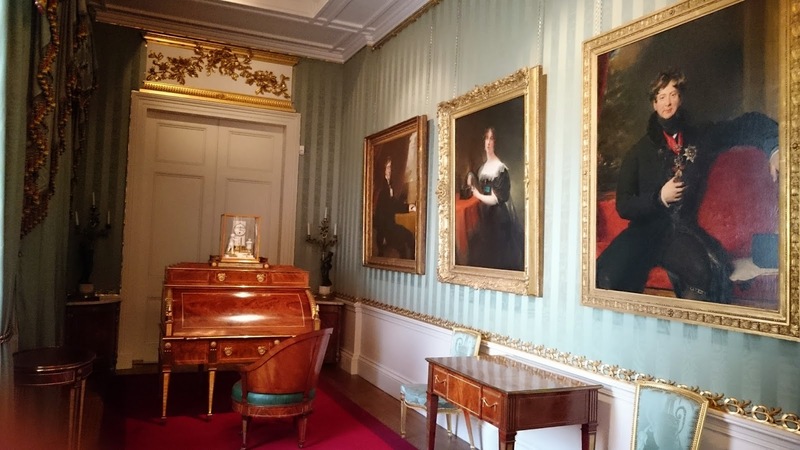 The Duke's portrait is displayed between those of Georgiana and his mistress, Lady Elizabeth Foster, who became his second wife after Georgiana's death. 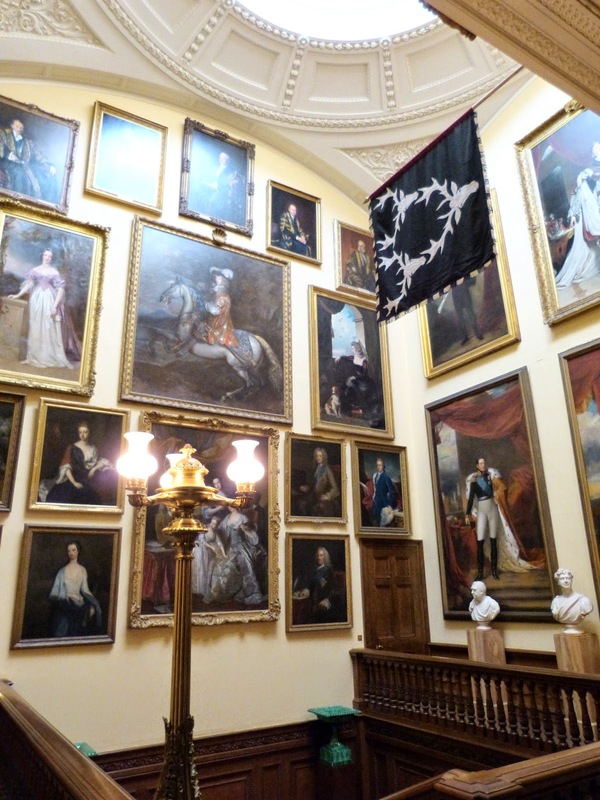 The West Sketch Gallery is devoted to the collections of the 3rd Earl of Burlington, whose daughter, Lady Charlotte Boyle, married the 4th Duke. 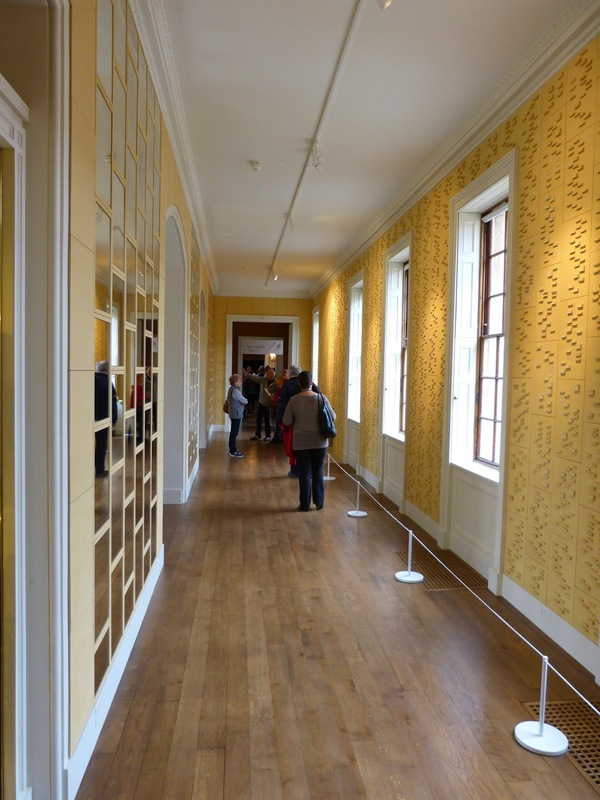 The ceramic panels on the right show an artistic representation of the Devonshire family based on DNA strands. 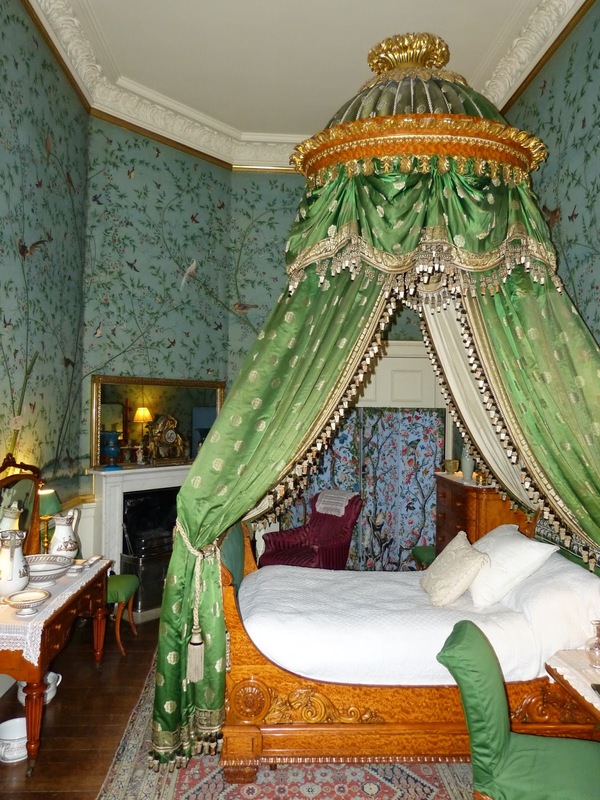 These rooms were converted into bedrooms by the 6th Duke. 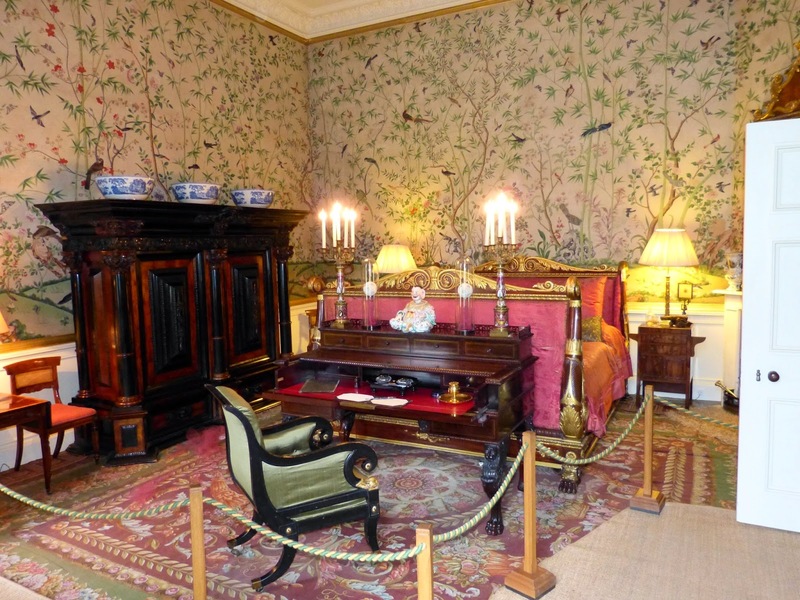 The Chinese wallpaper is hand-painted and was very fashionable during the Regency period. 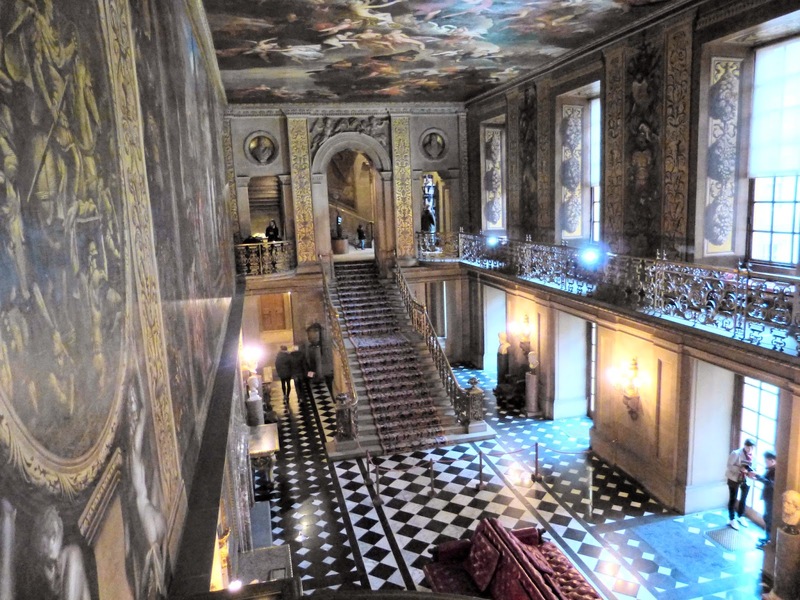 The 6th Duke built the Oak Stairs to lead to his new north wing. 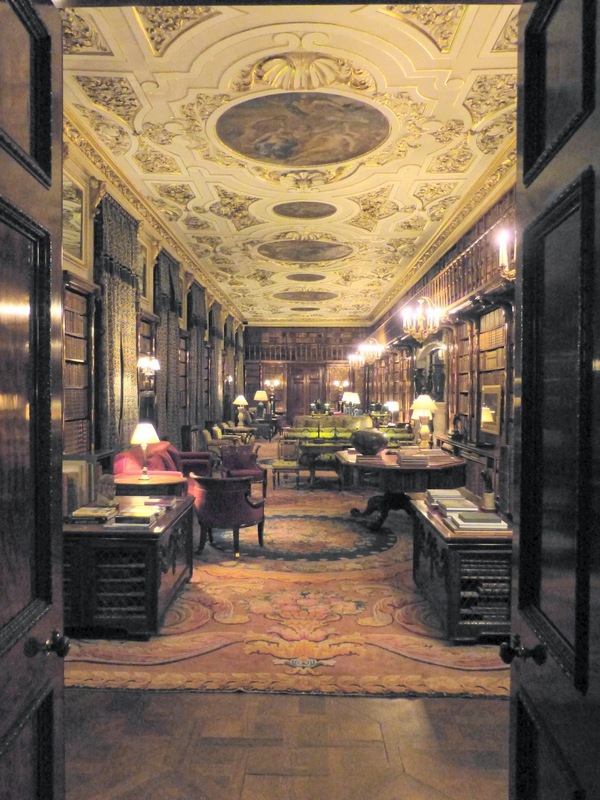 The 6th Duke turned the 1st Duke's Long Gallery into a sumptuous new library. 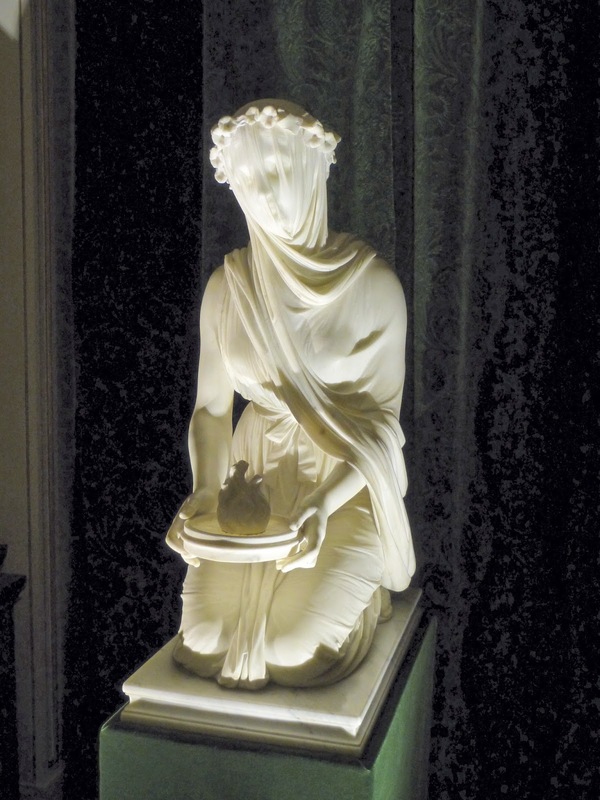 The Veiled Vestal Virgin (above) was carved in marble by Raffaelle Monti for the 6th Duke in 1846. 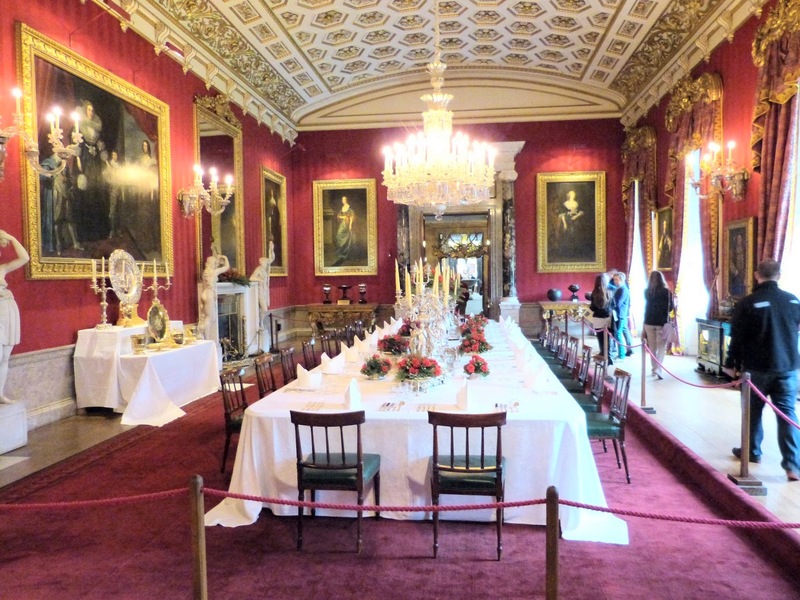 The young Queen Victoria had her first adult dinner here when she was 13. 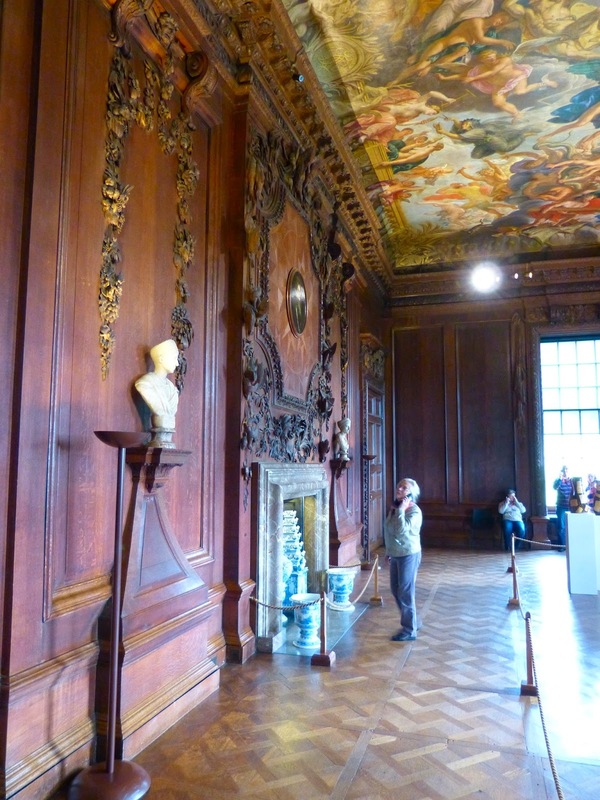 The sculptures in the 6th Duke's collection were created by contemporary artists in the classical style. 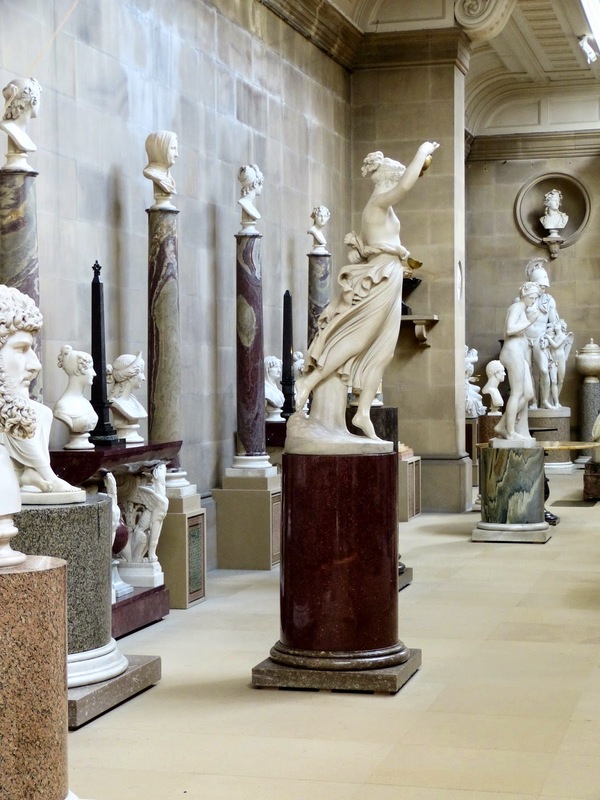 His most prized pieces were by the sculptor Antonio Canova who became his close friend. 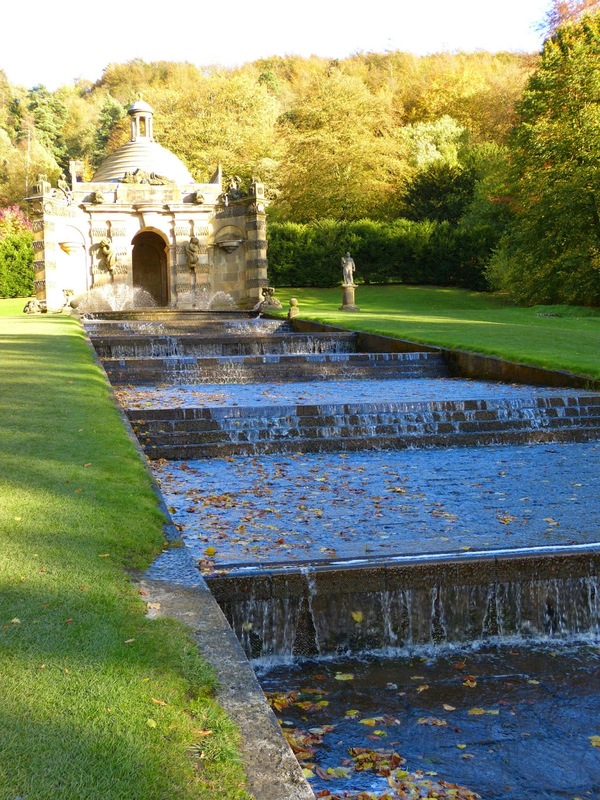 "The famous Cascade, one of those grand water works, which half a century ago, rendered Chatsworth the greatest wonder of Derbyshire, and gave it a celebrity which it has not yet lost, lies to the south-east of the house. 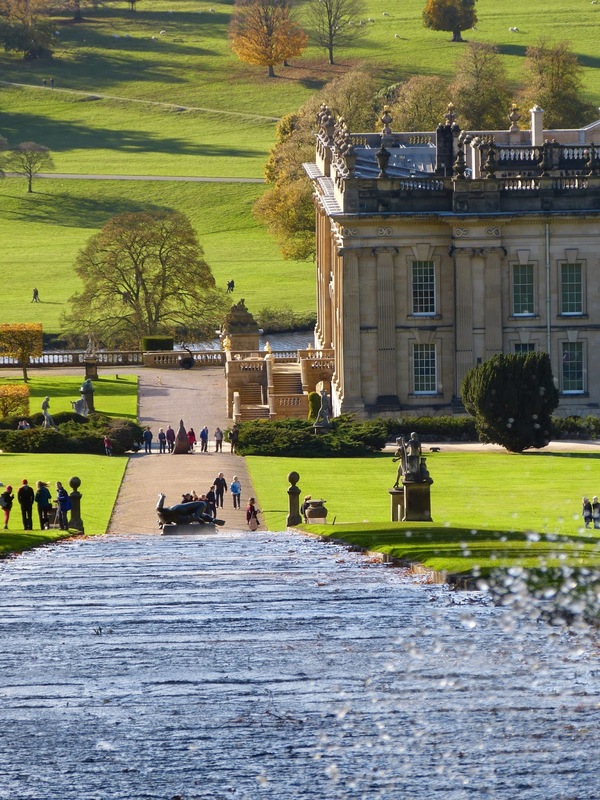 It consists of a series or flight of steps, extending nearly two hundred yards from one end to the other, down a steep hill, crowned at the top with a Temple. 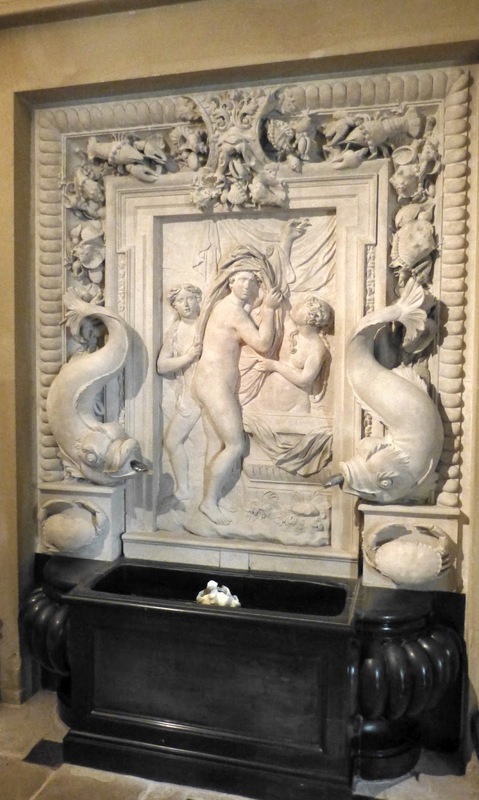 This fane, (observes Mr. Warner) should certainly be dedicated to Mercury, the god of fraud and deceit, as a piece of roguery is practiced upon the incautious stranger within its very sanctuary; from the floor of which, a multitude of little fountains suddenly spout up, whilst he is admiring the prospect through the portal, and quickly wet him to the skin. 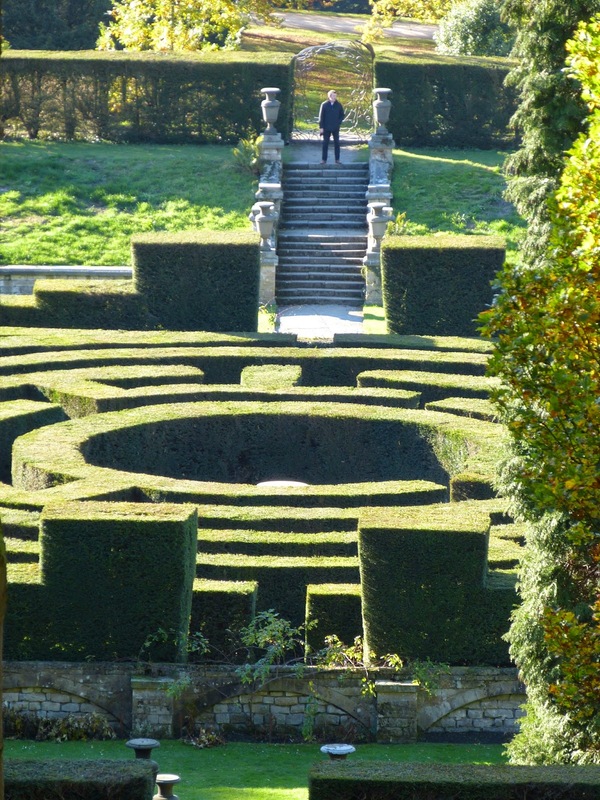 Sadly, not as old as the one at Hampton Court - this maze was planted in the 1960s! 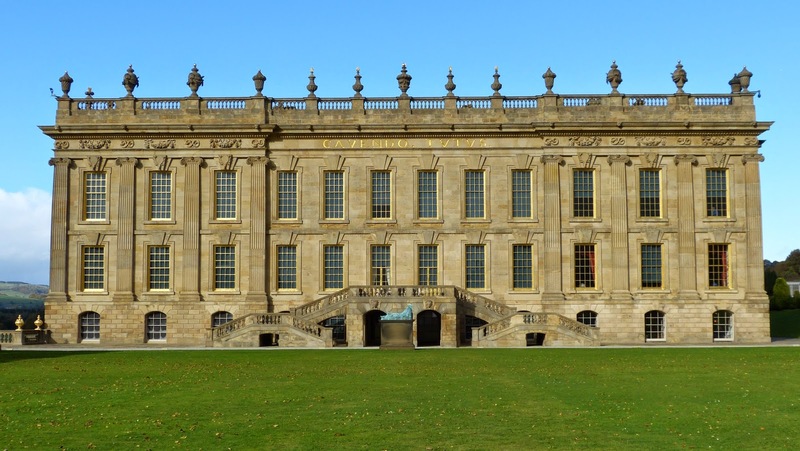 For more about the history of Chatsworth and the Georgians who lived there, see my Regency History guide to Chatsworth. (1) From a letter from Horace Walpole to George Montagu dated 1 September 1760. (2) From Peak Scenery or The Derbyshire Tourist by E Rhodes (1824). (3) From Louis Simond's Journal of his tour in 1810-11. (4) From David Davies' A new historical and descriptive view of Derbyshire (1811).